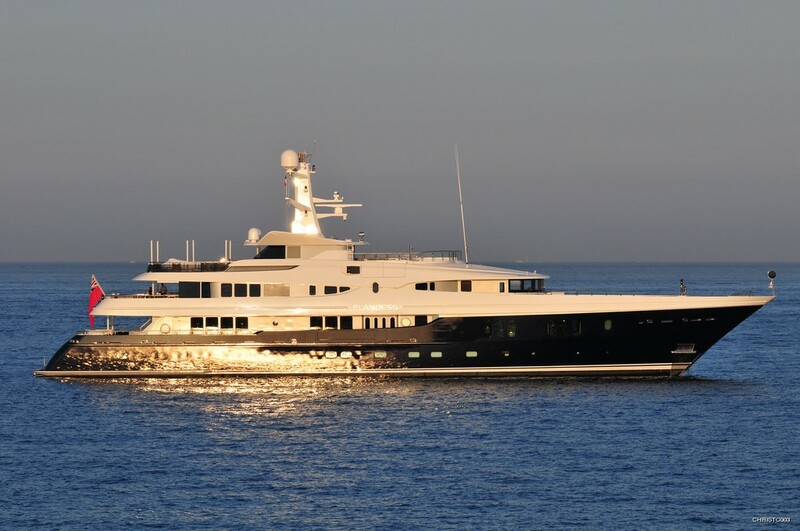 Motor yacht ELYSIAN (Ex Elandess) is a 60 meter (196.85ft) Abeking & Rasmussen superyacht launched in 2009, with exterior design by Donald Starkey Designs and interior design created by Bannenberg & Rowell. 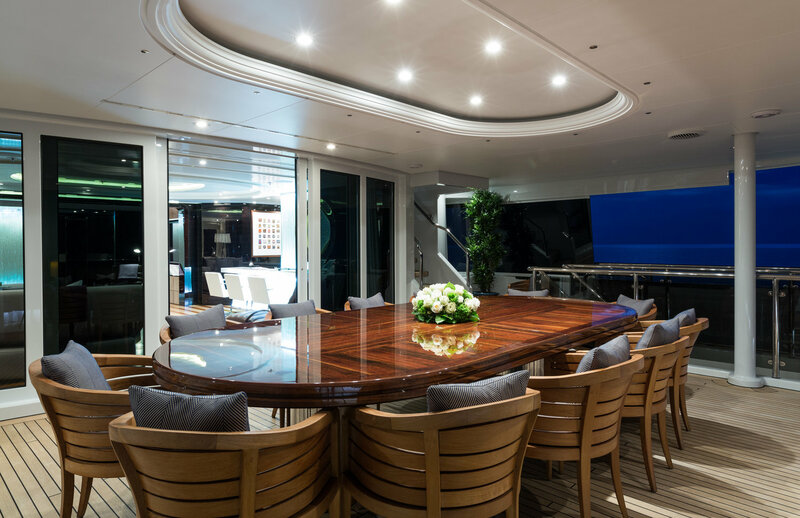 With a refit by Integrated Marine Group in 2012, ELYSIAN (Ex Elandess) superyacht has a luxurious, distinctively contemporary interior and ample space for outdoor relaxation of her guests on all three levels, representing a modern concept design with a classic, sophisticated look. 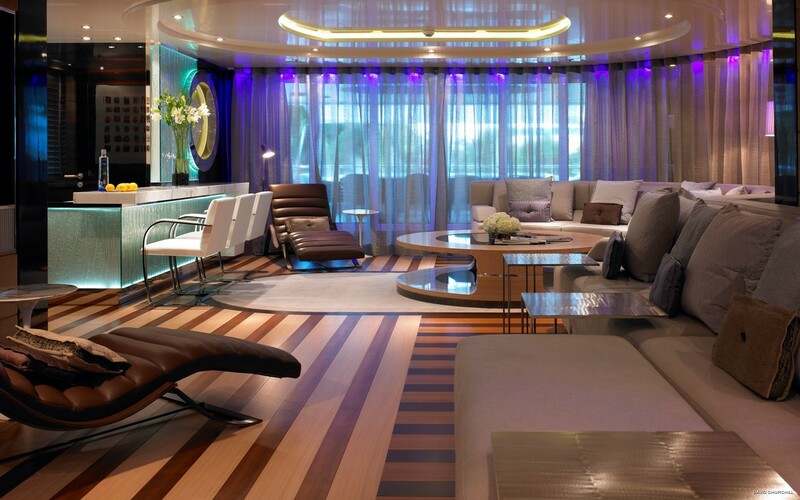 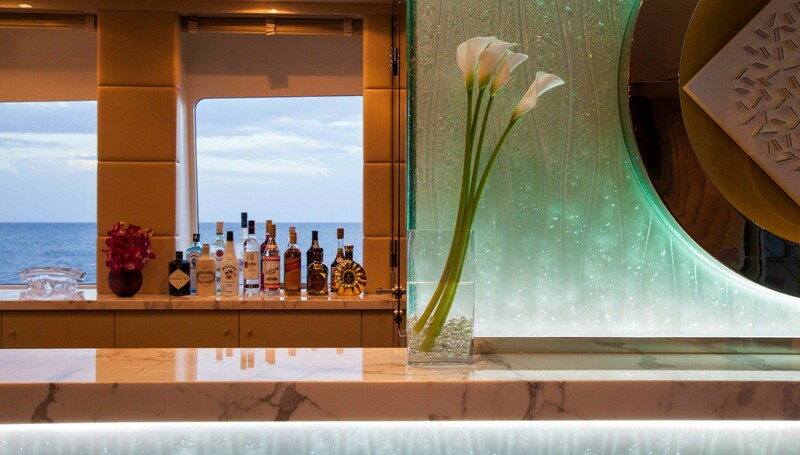 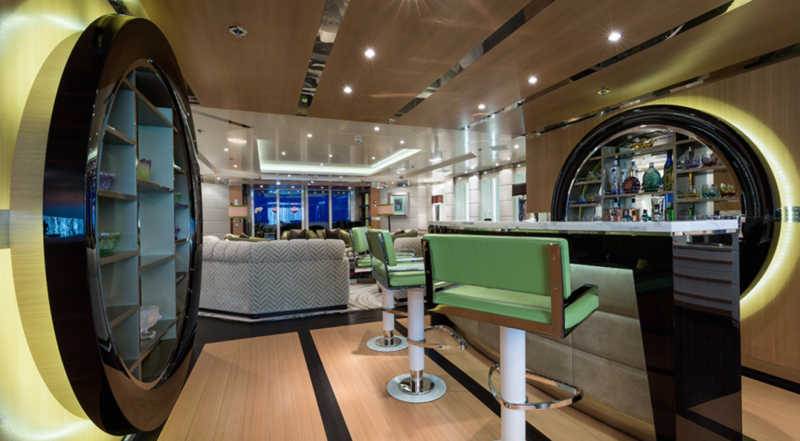 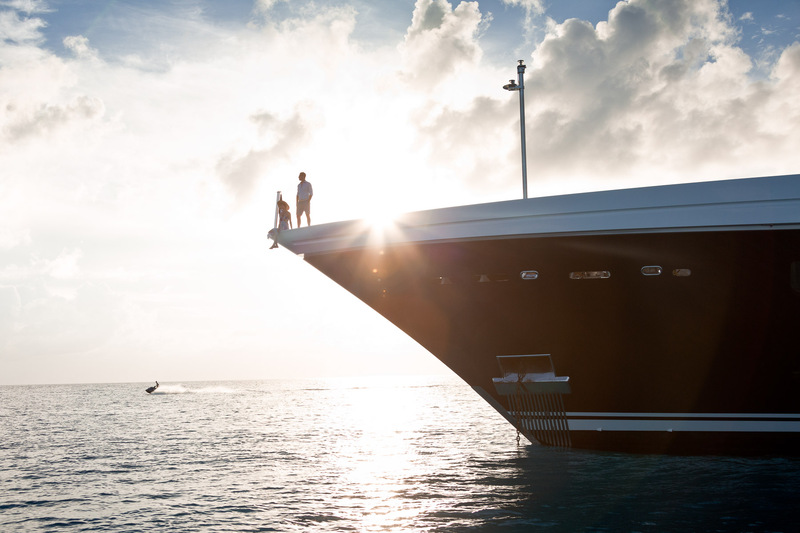 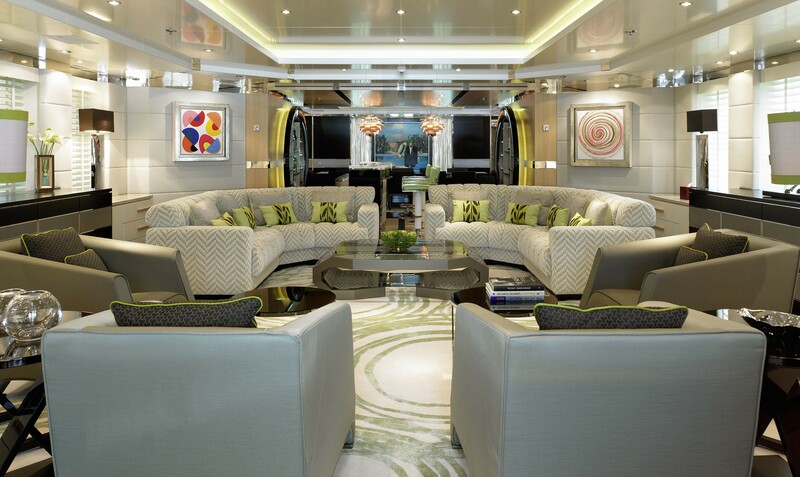 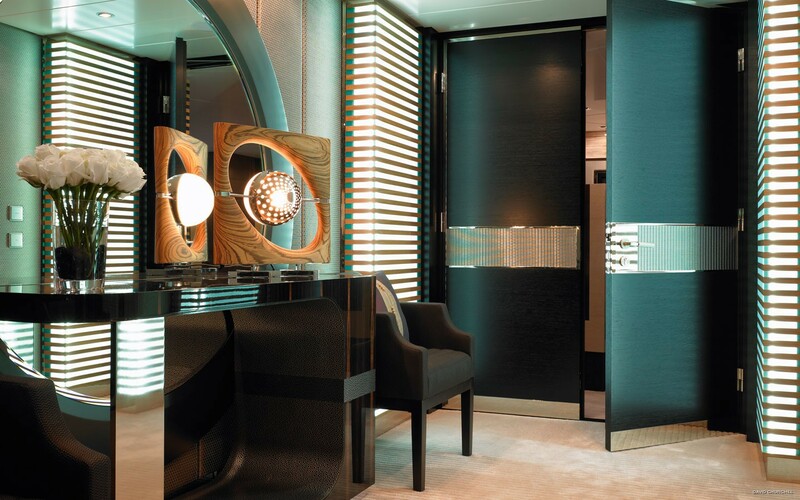 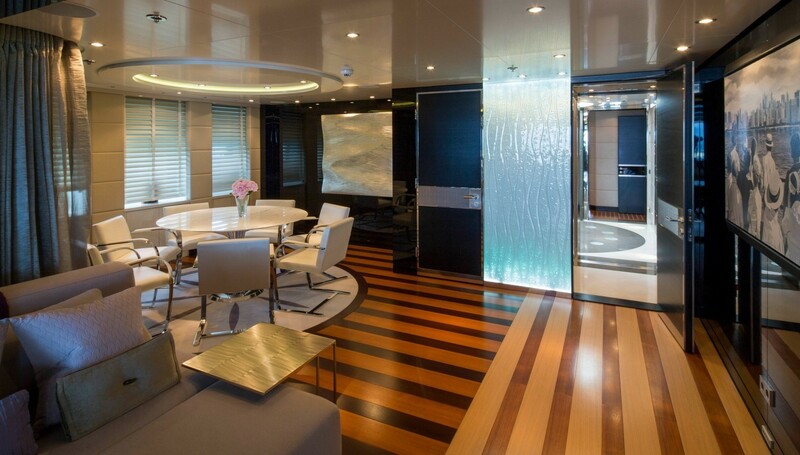 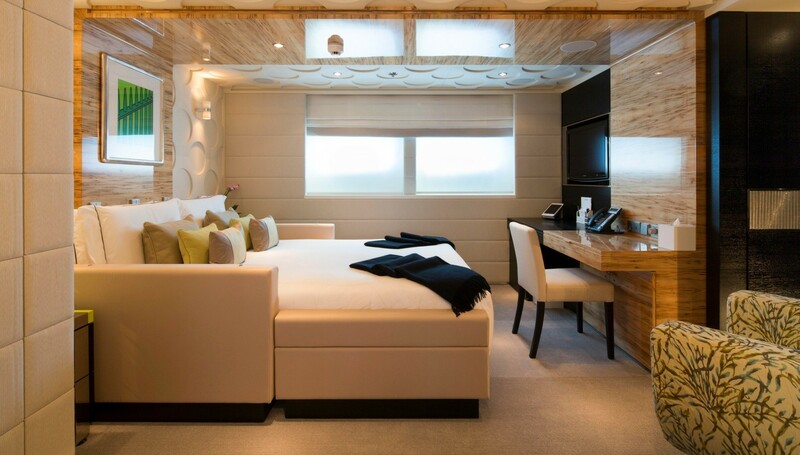 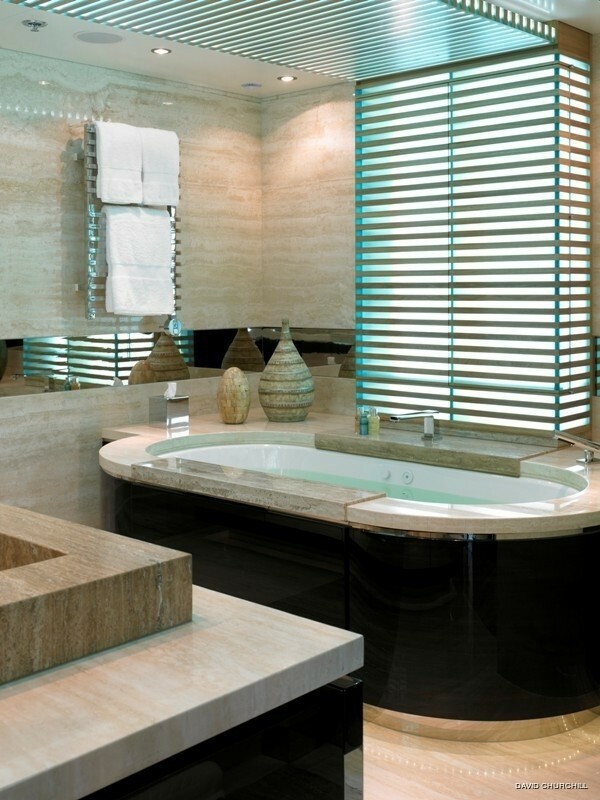 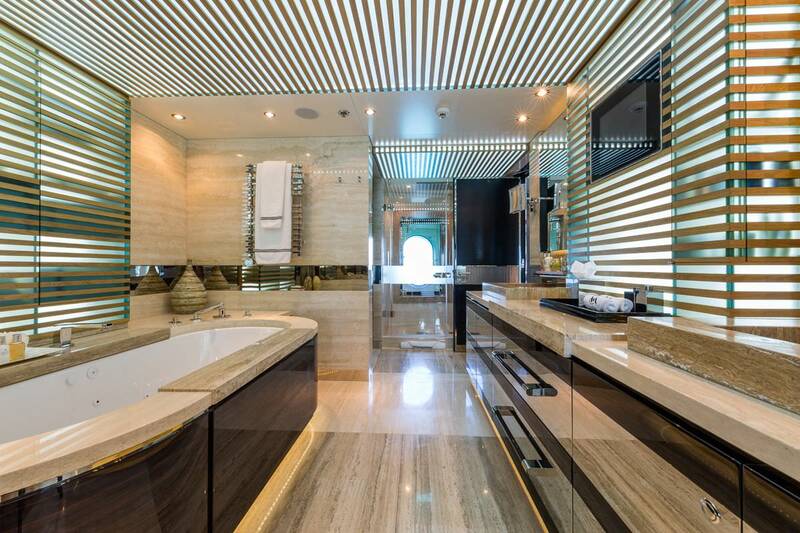 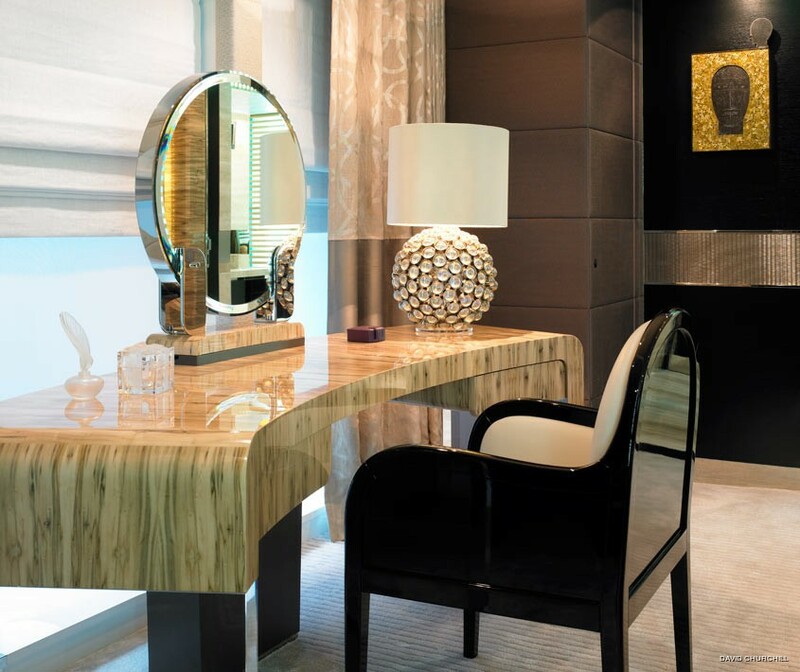 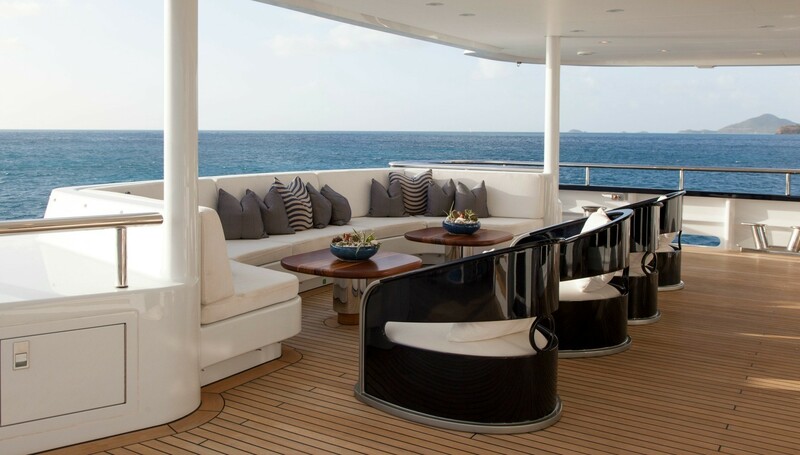 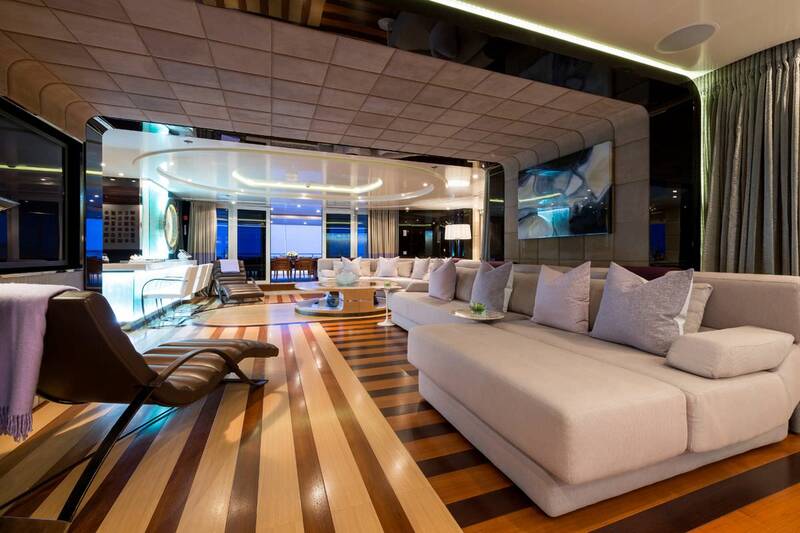 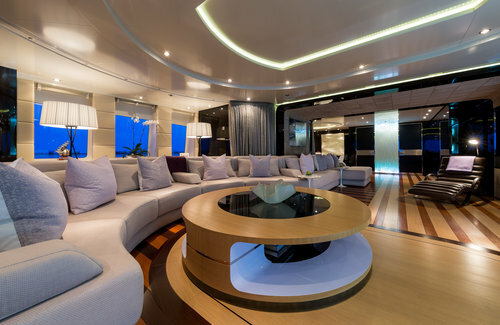 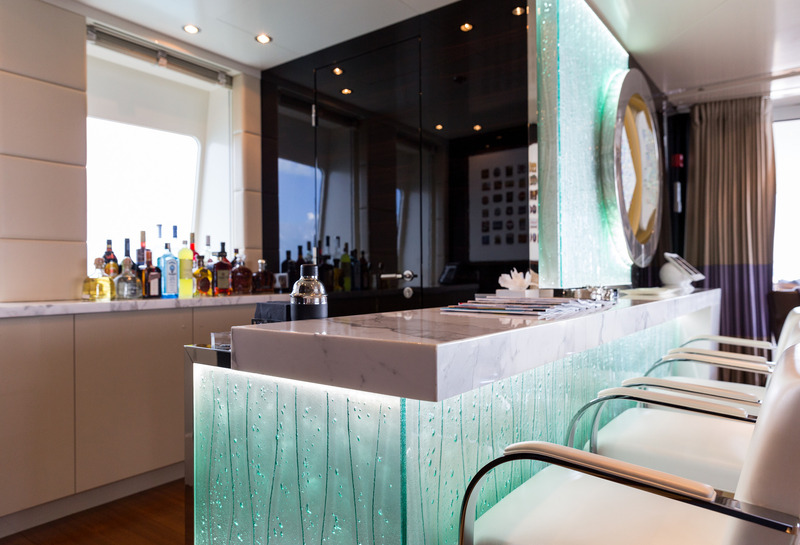 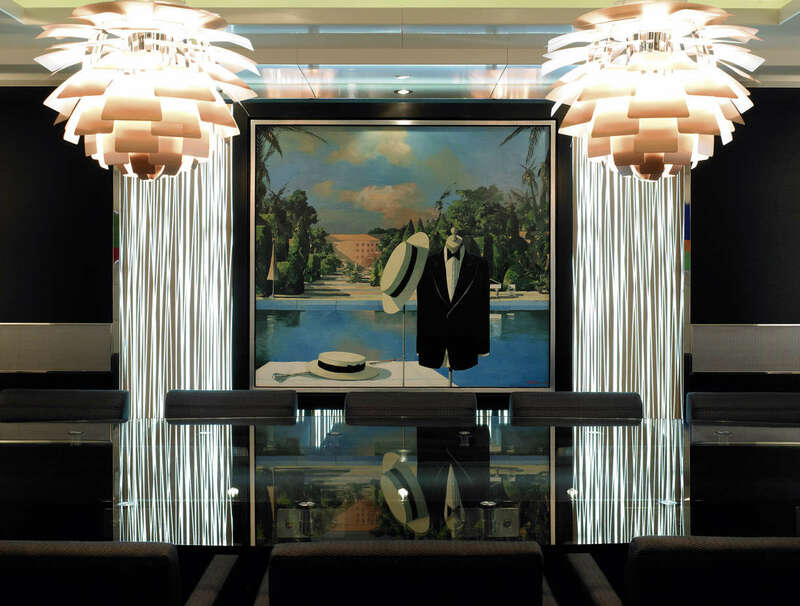 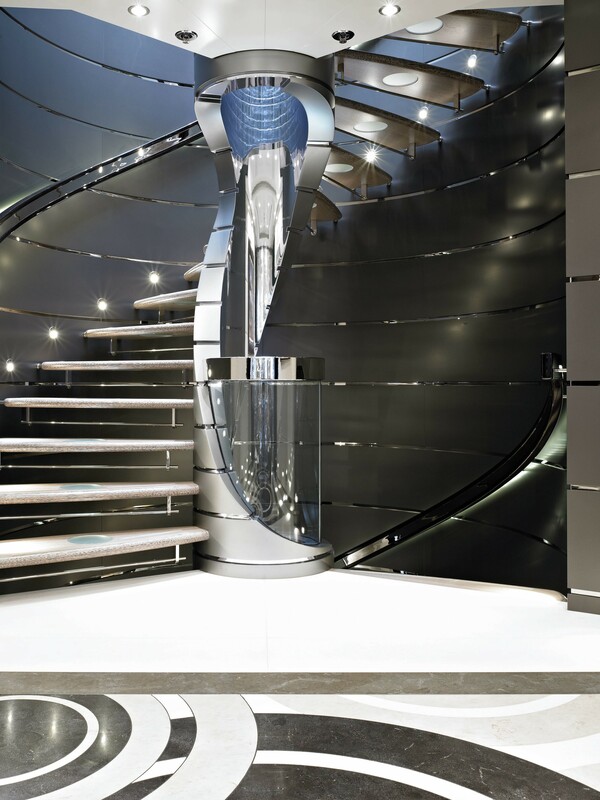 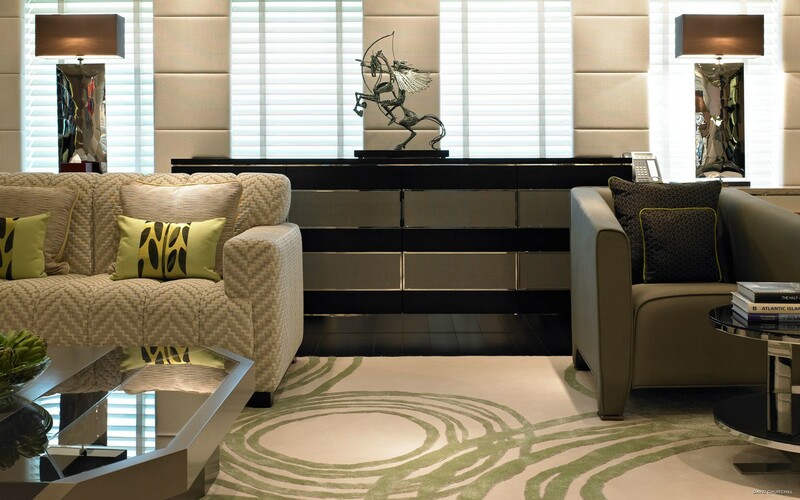 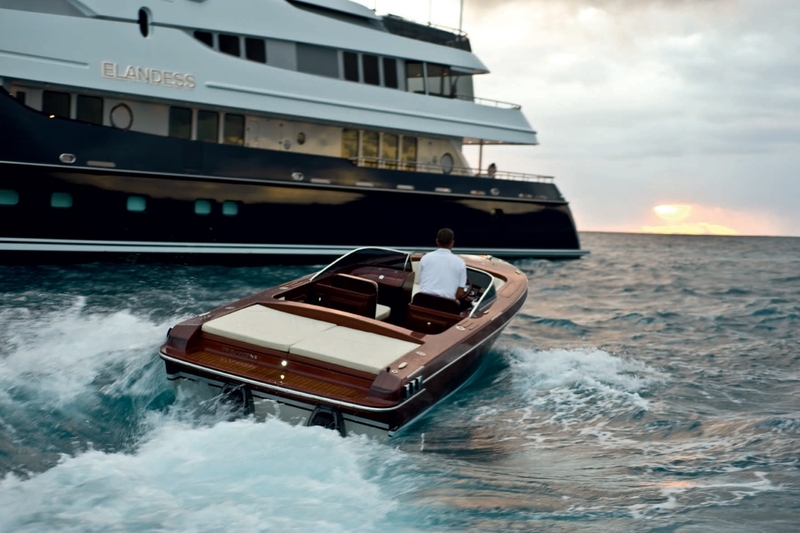 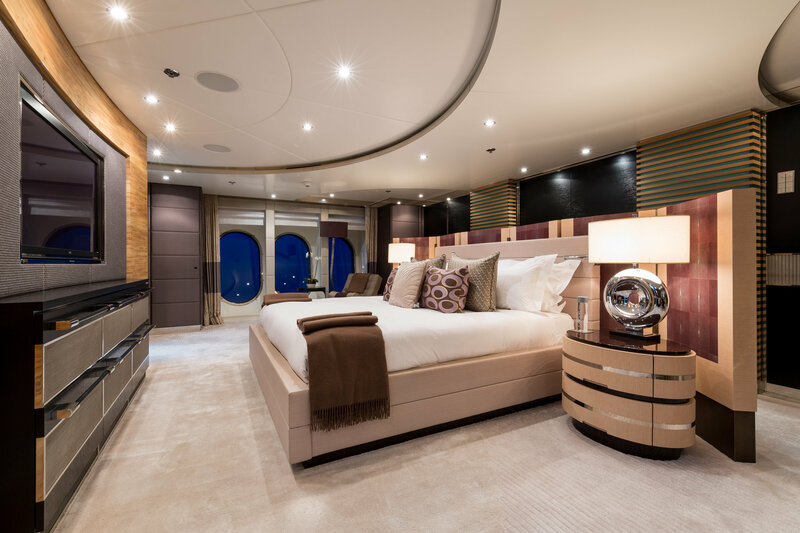 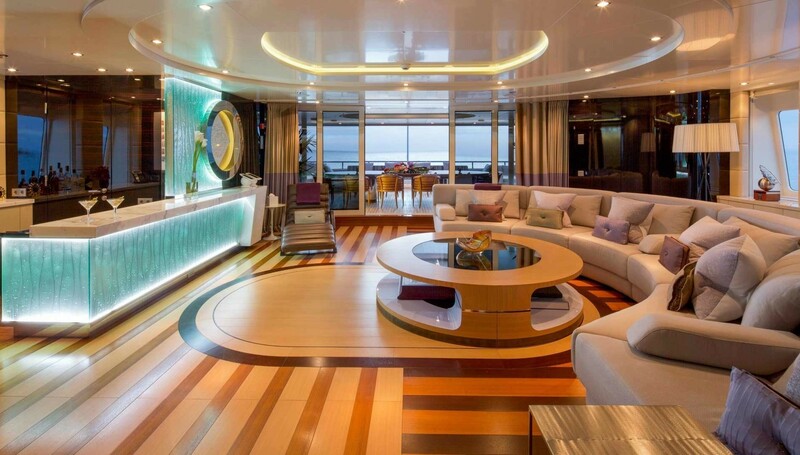 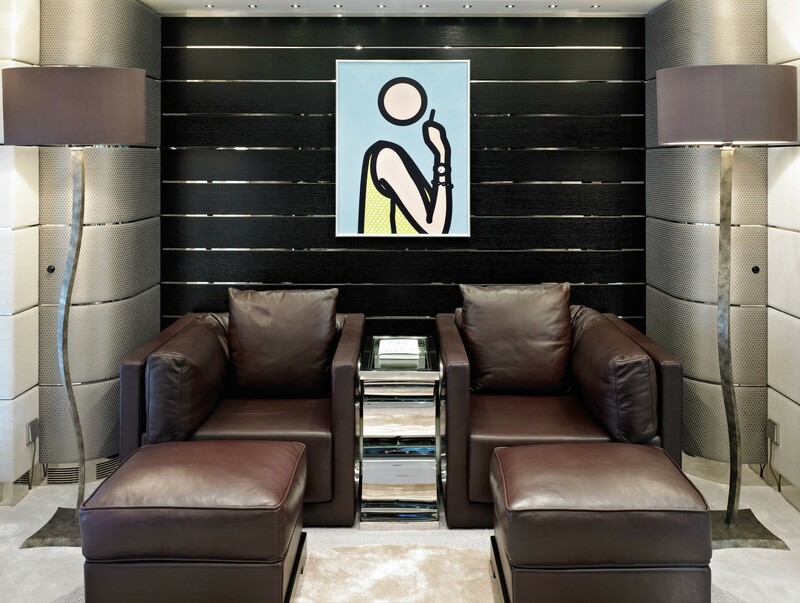 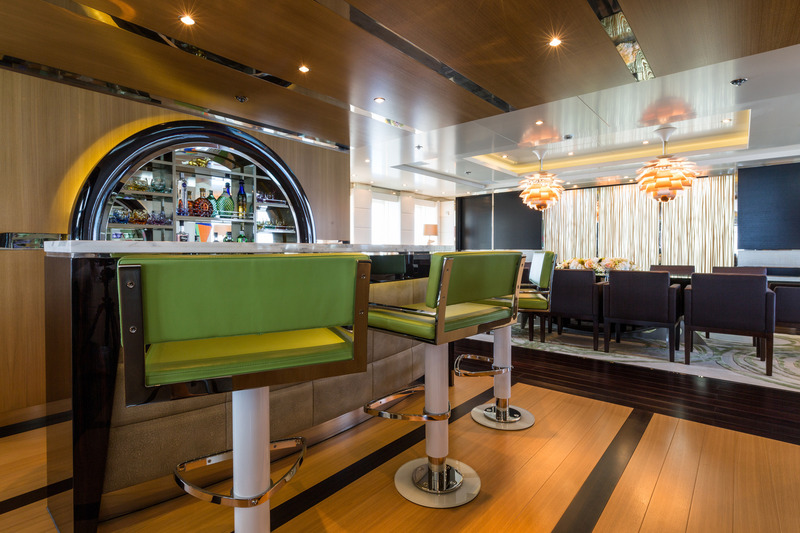 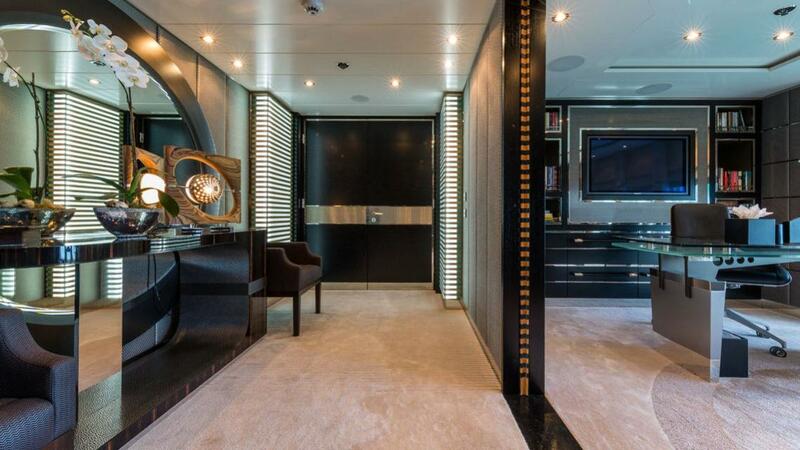 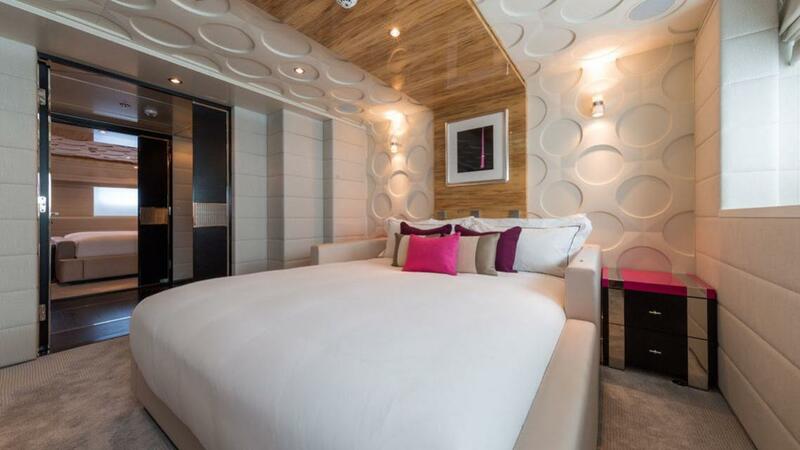 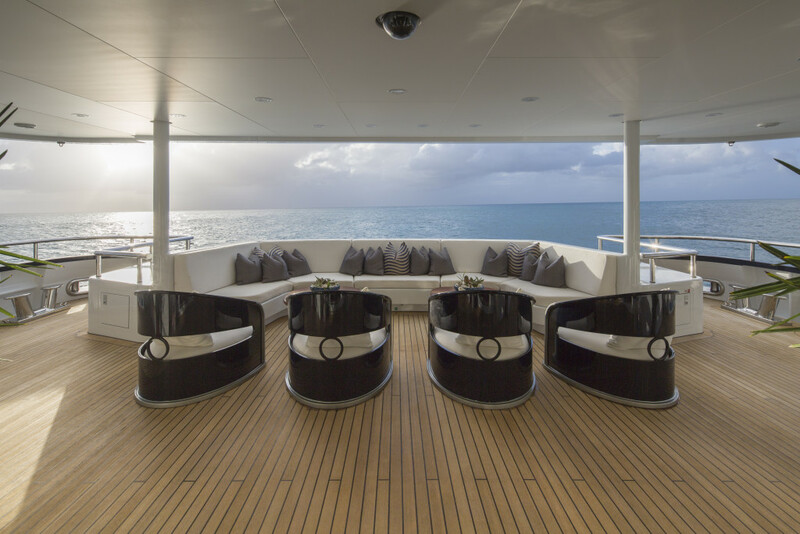 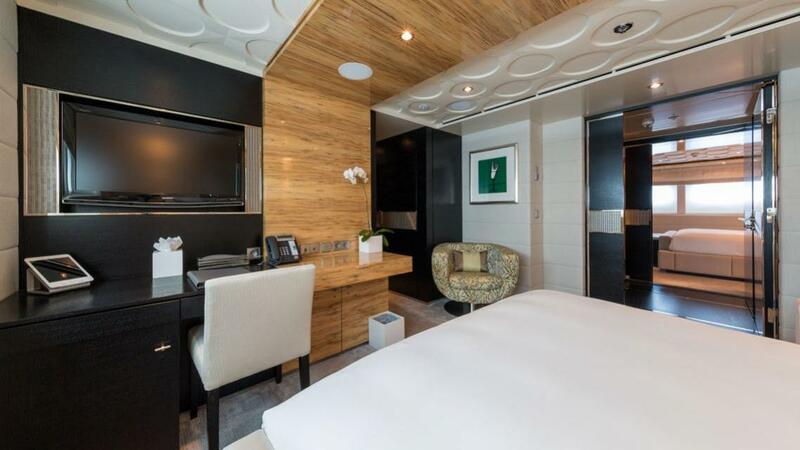 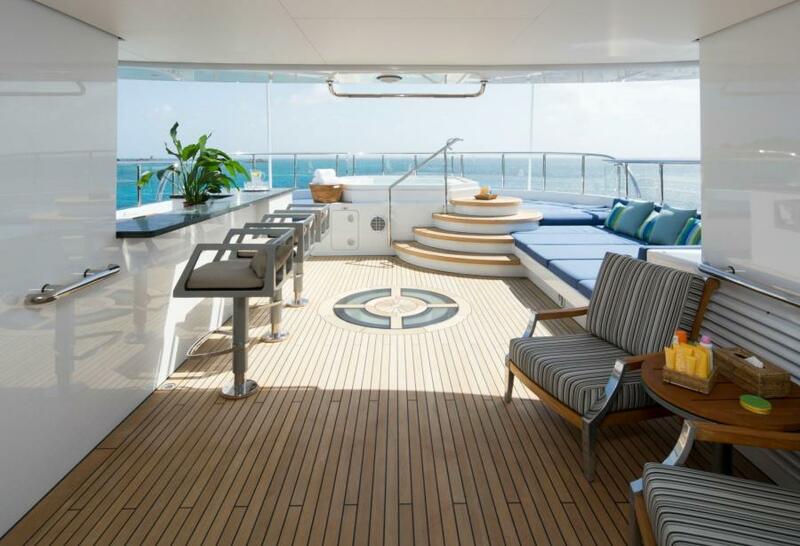 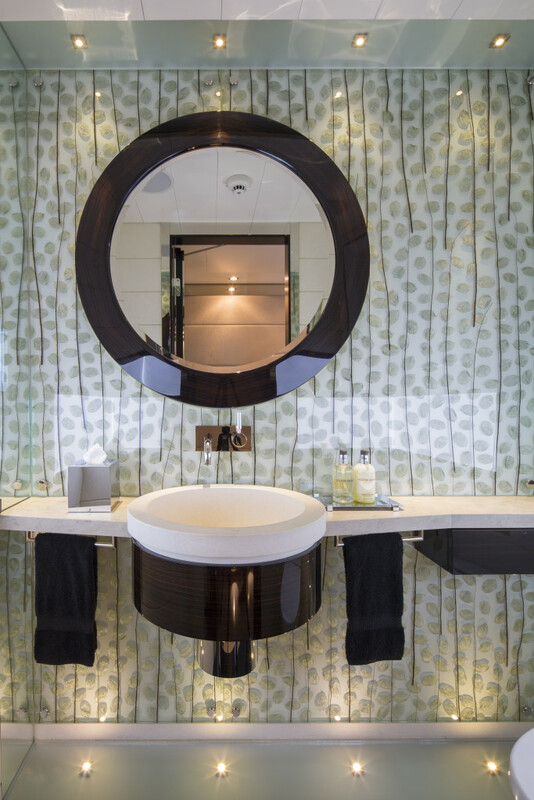 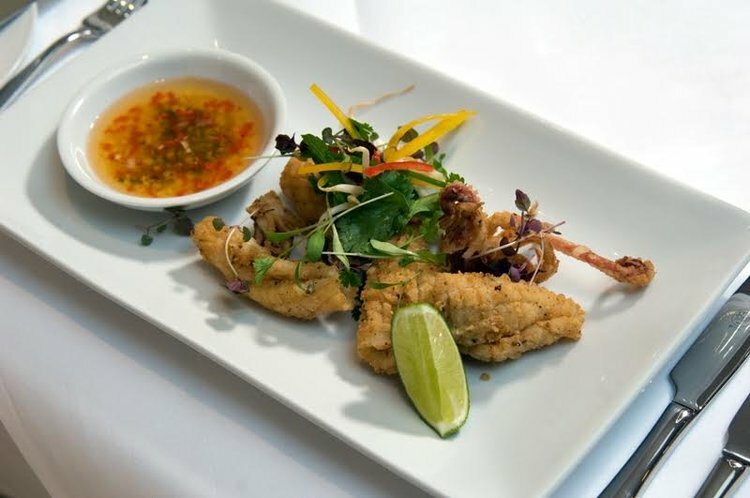 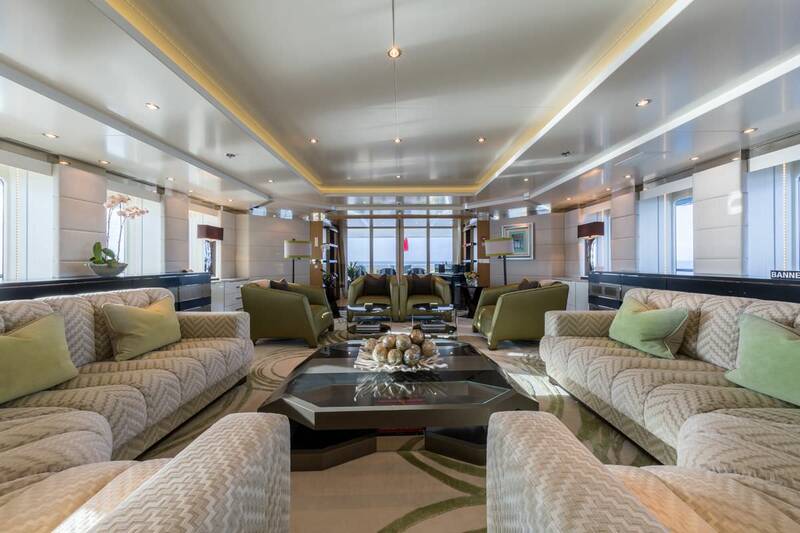 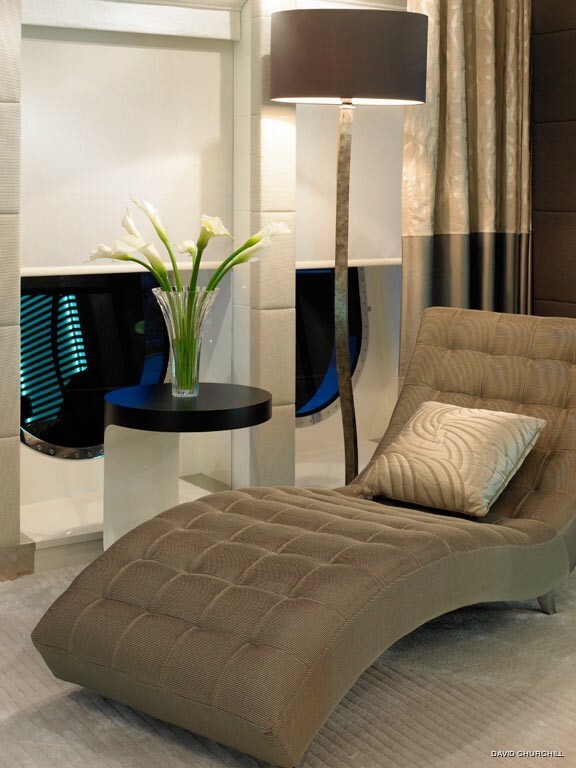 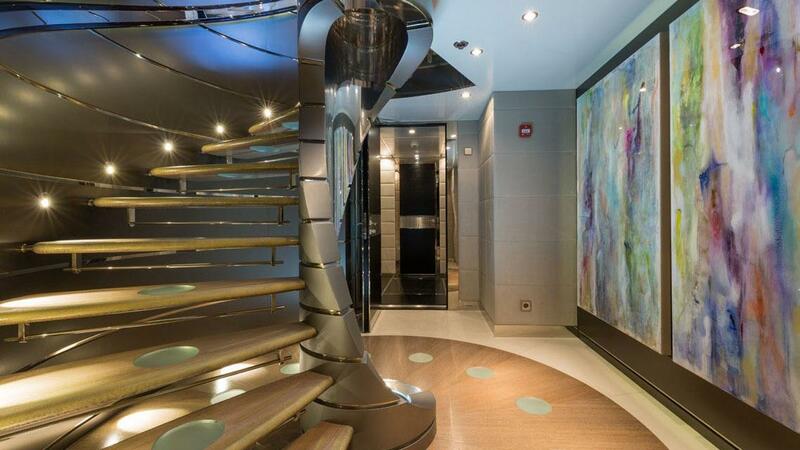 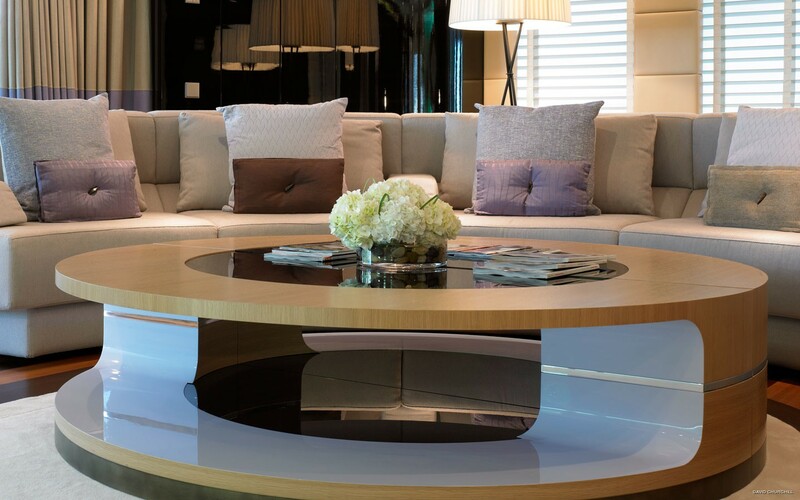 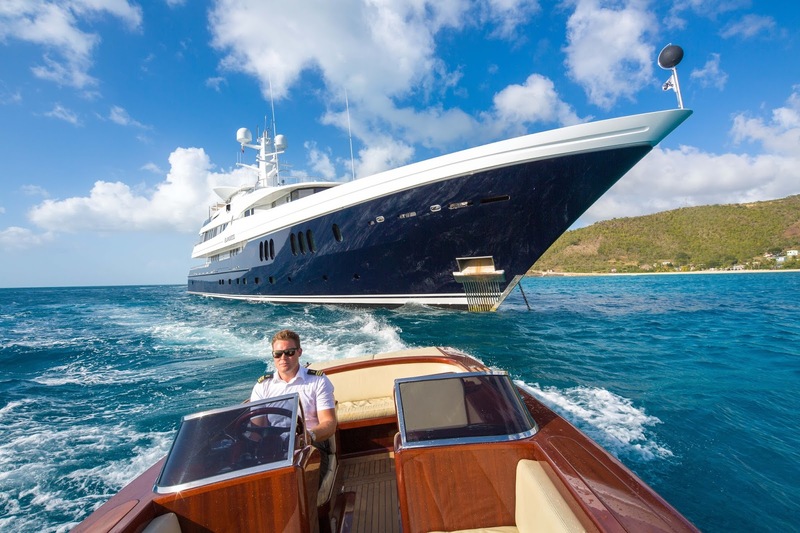 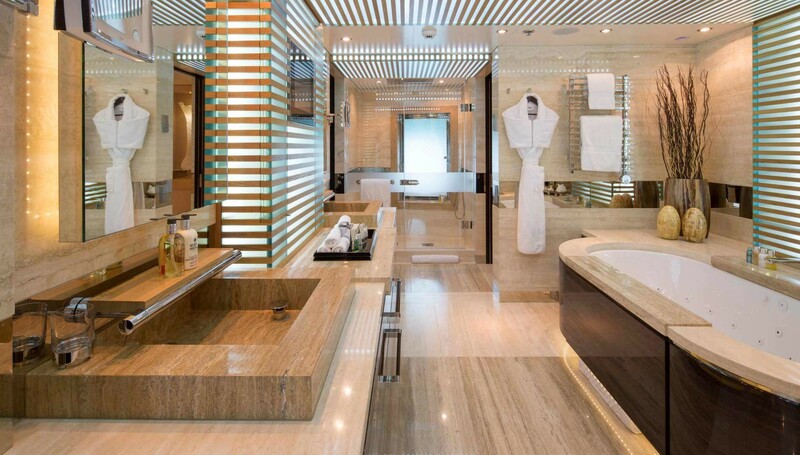 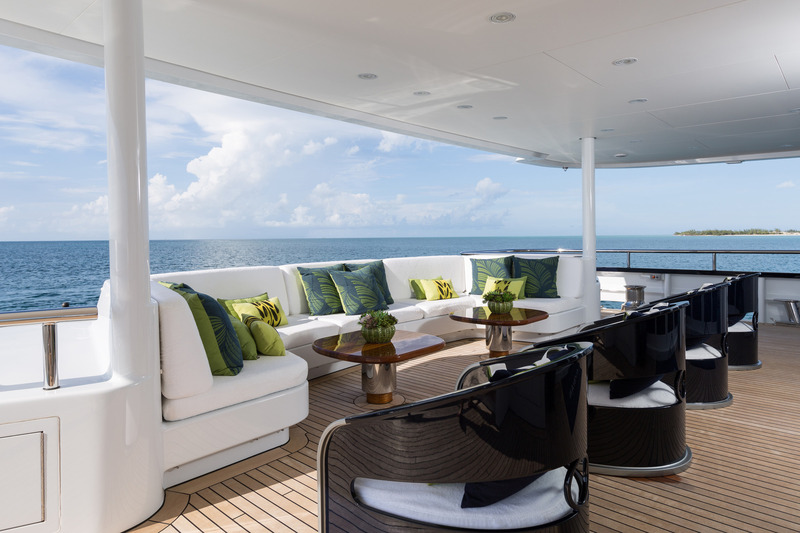 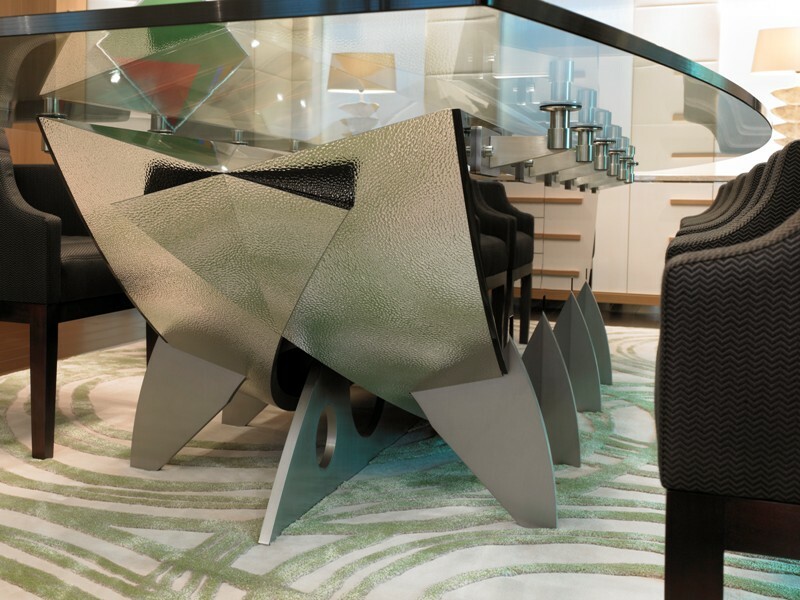 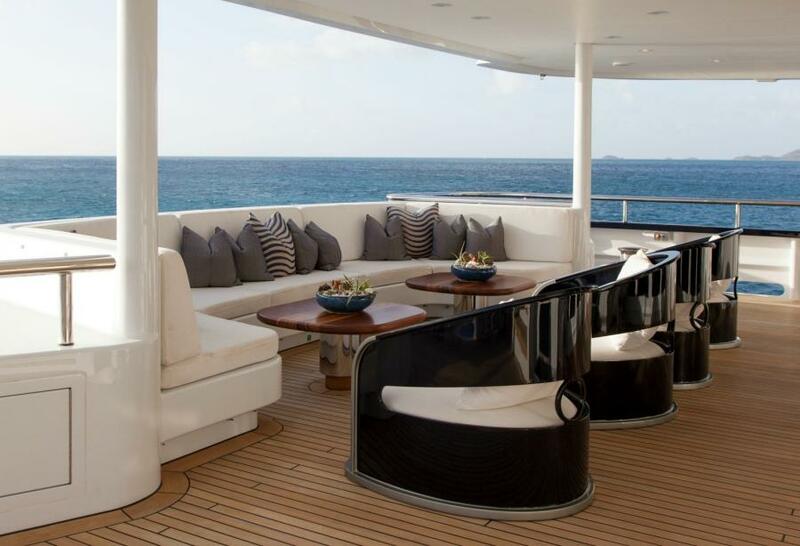 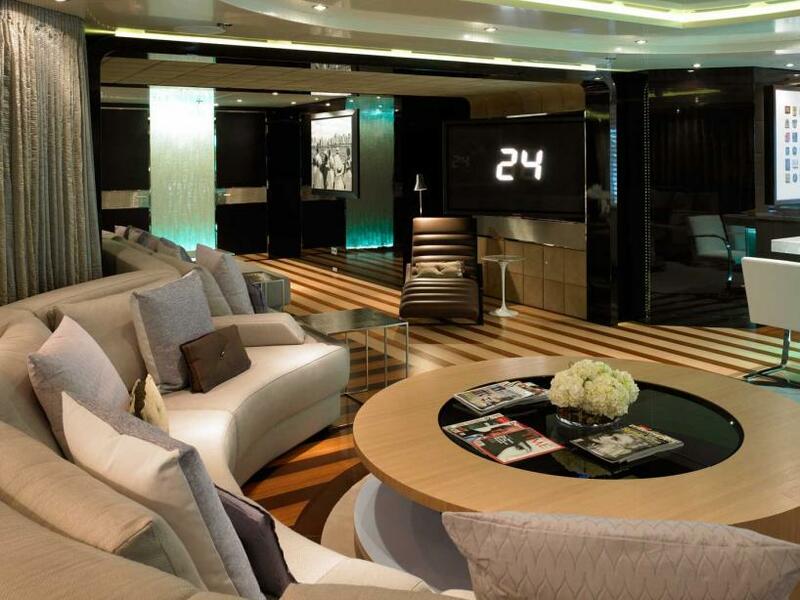 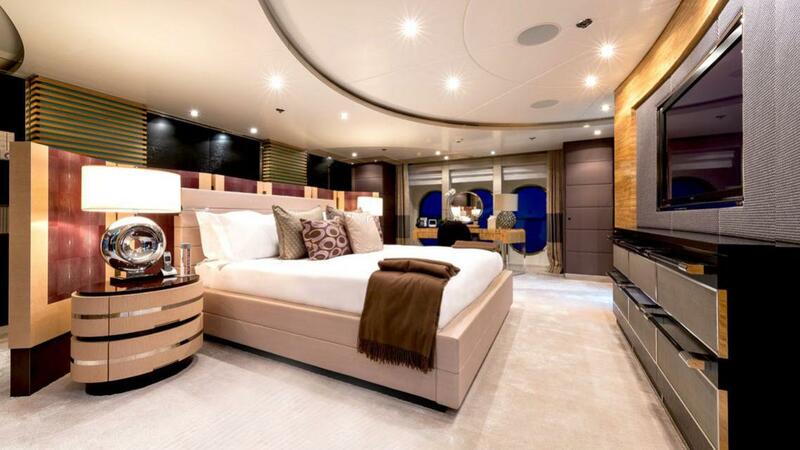 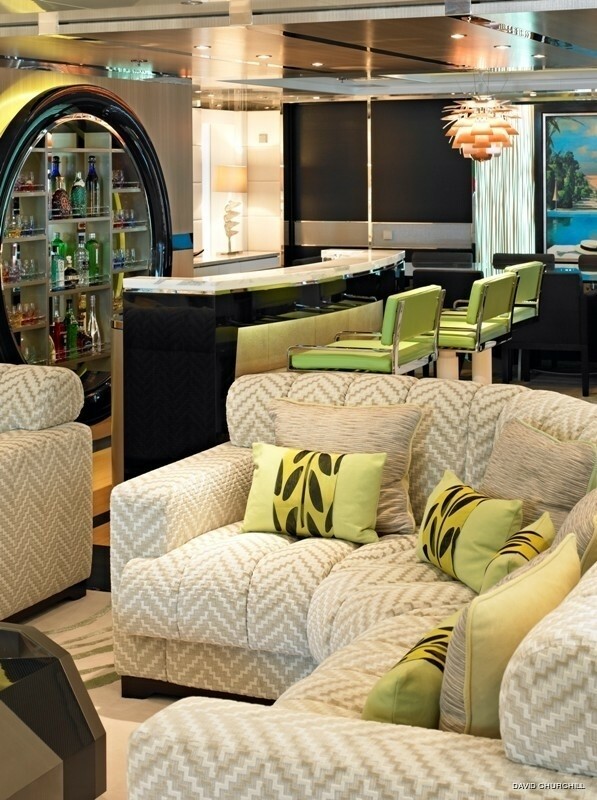 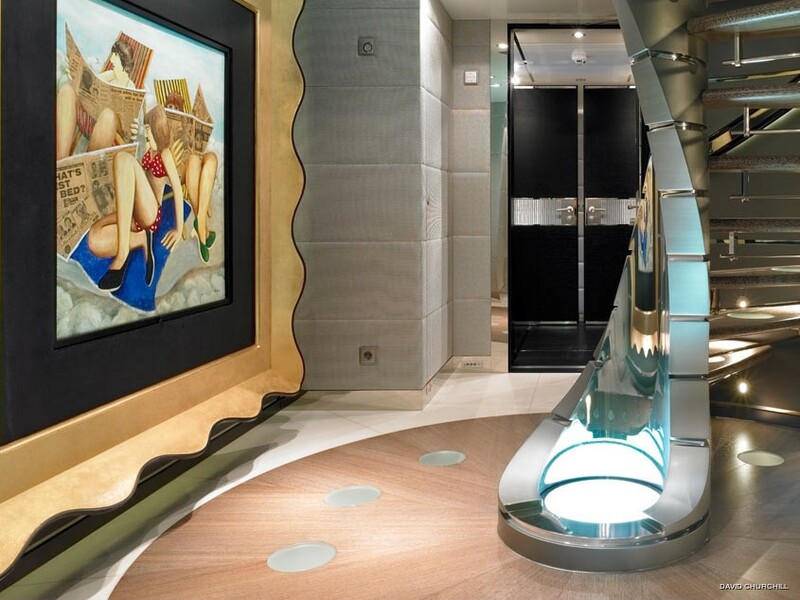 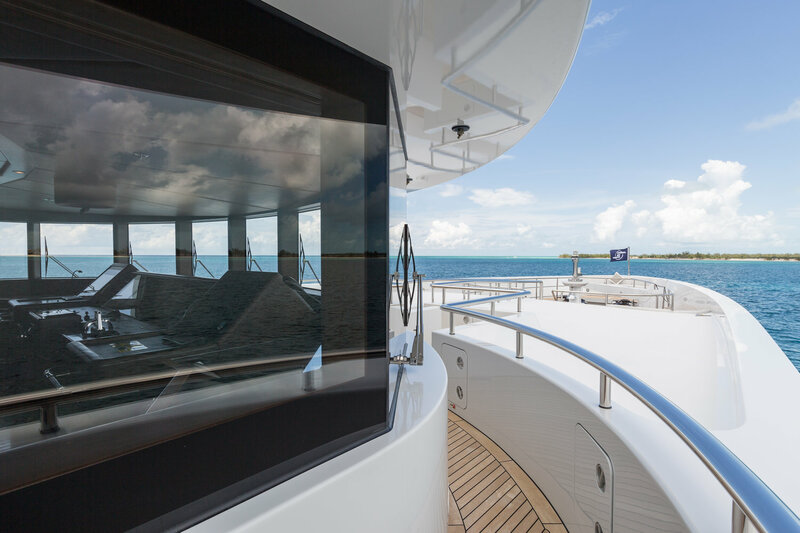 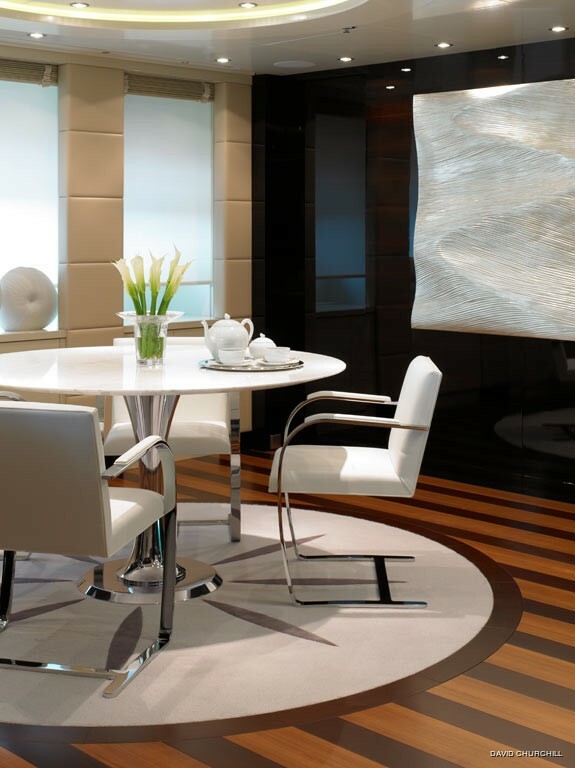 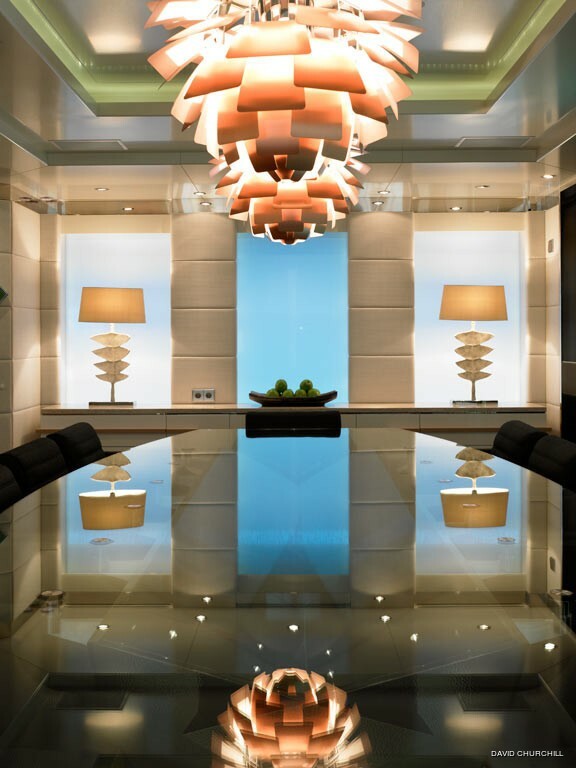 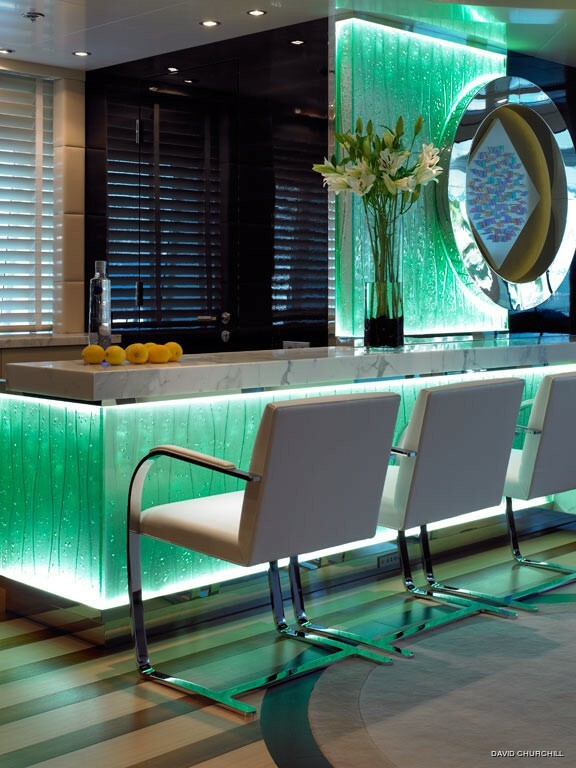 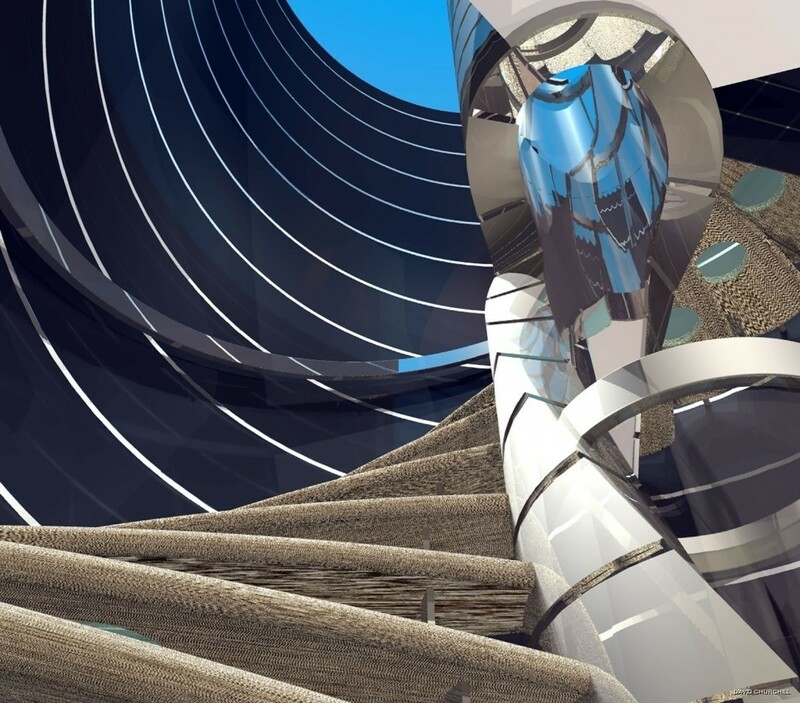 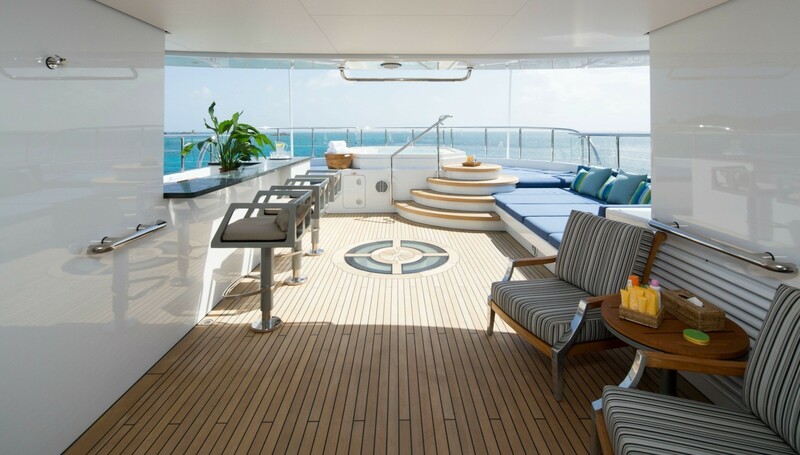 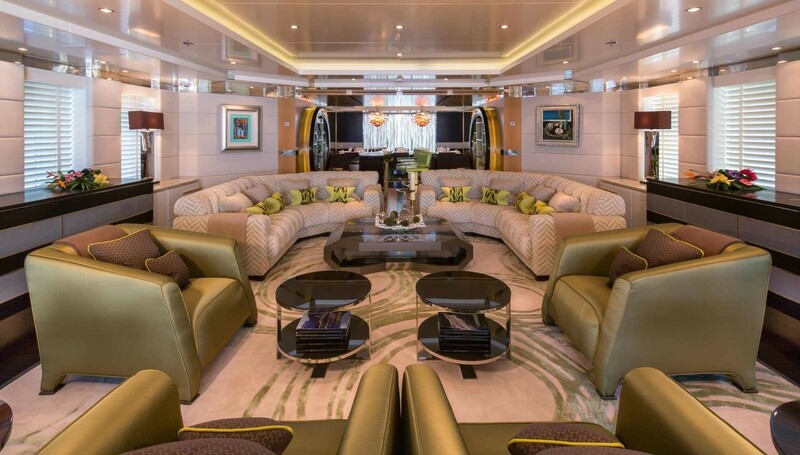 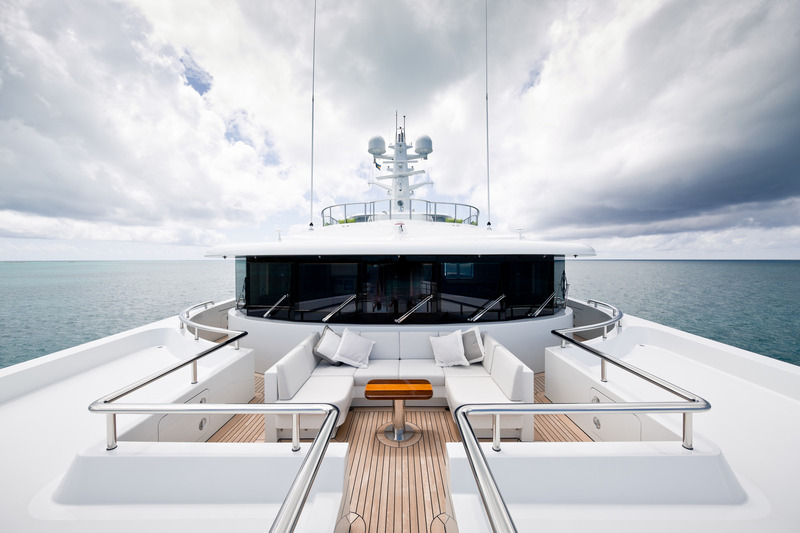 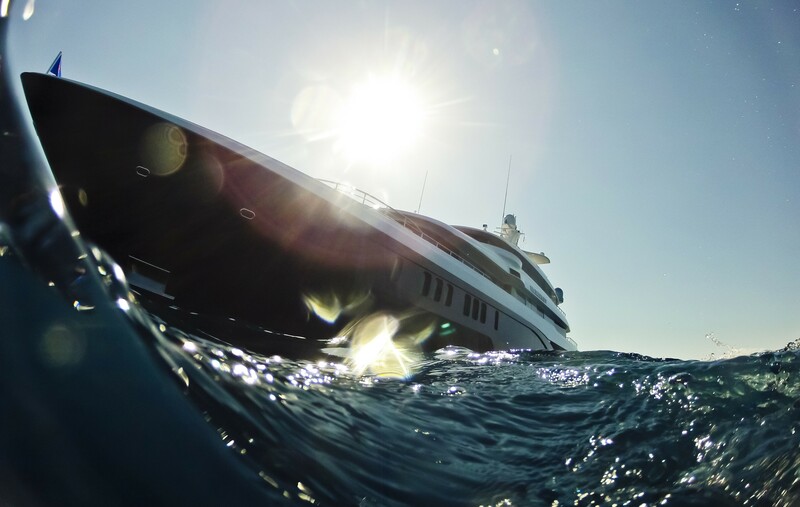 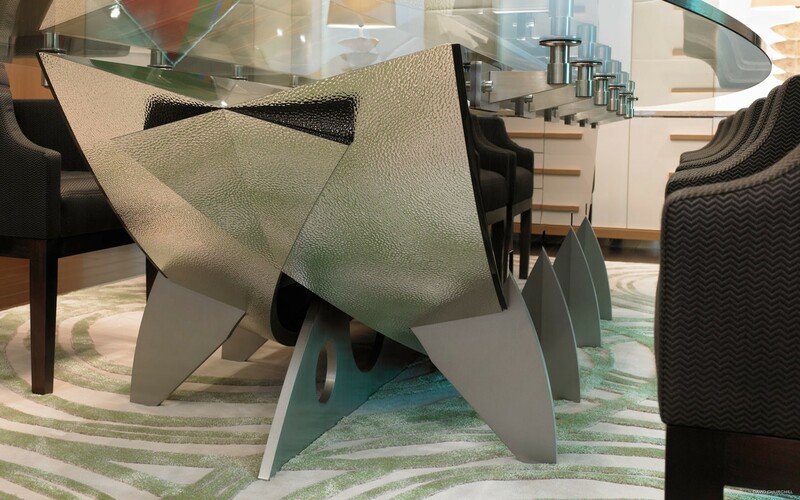 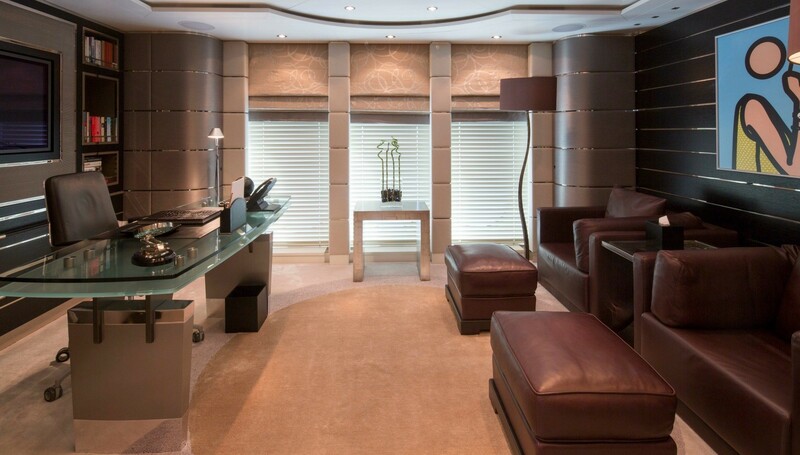 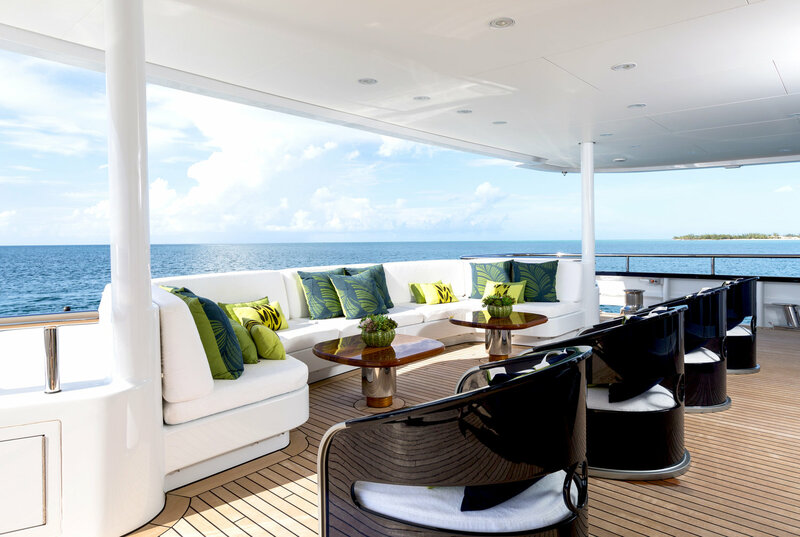 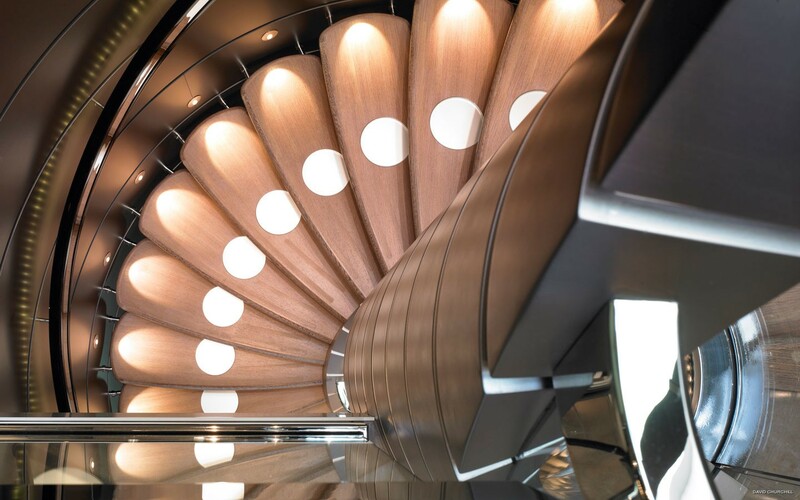 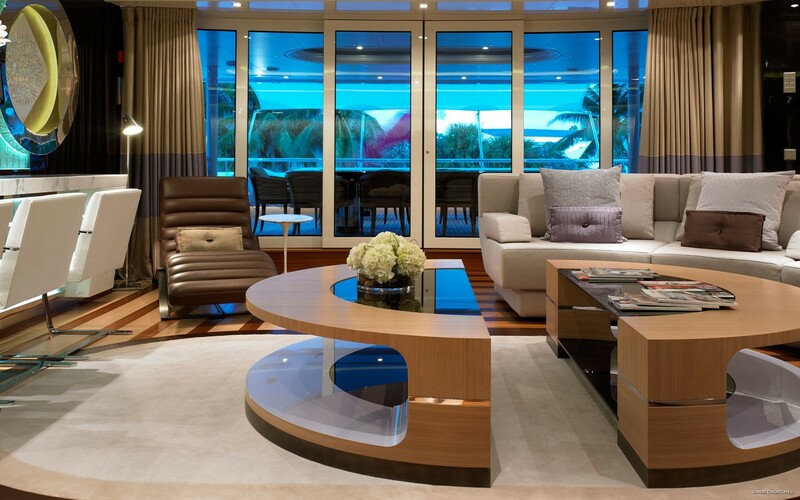 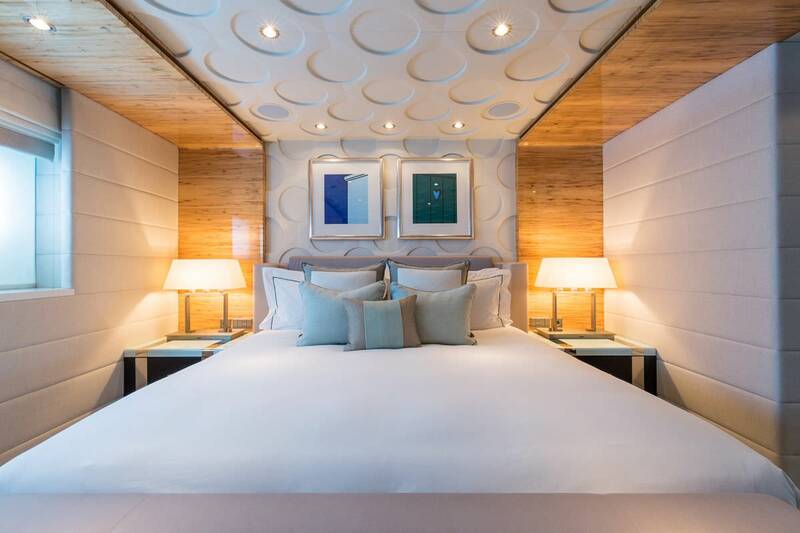 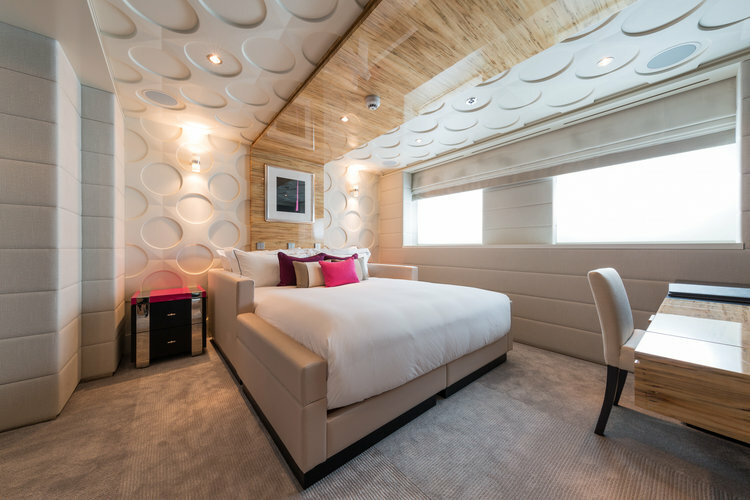 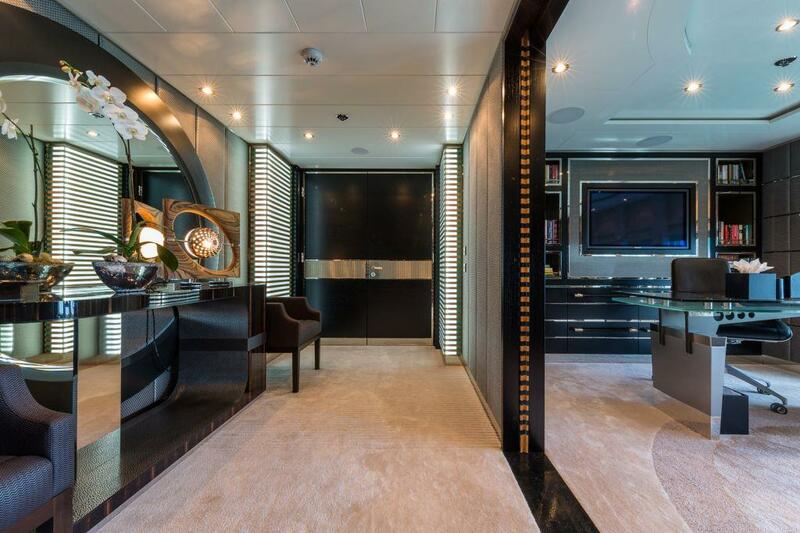 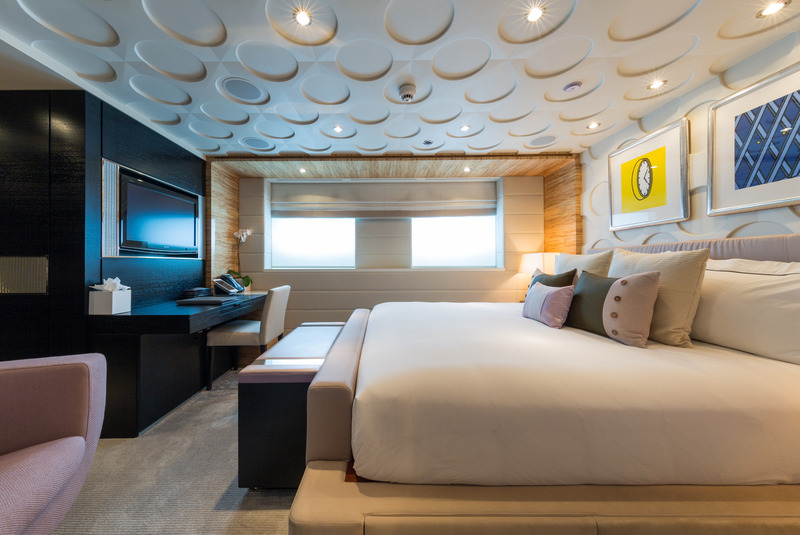 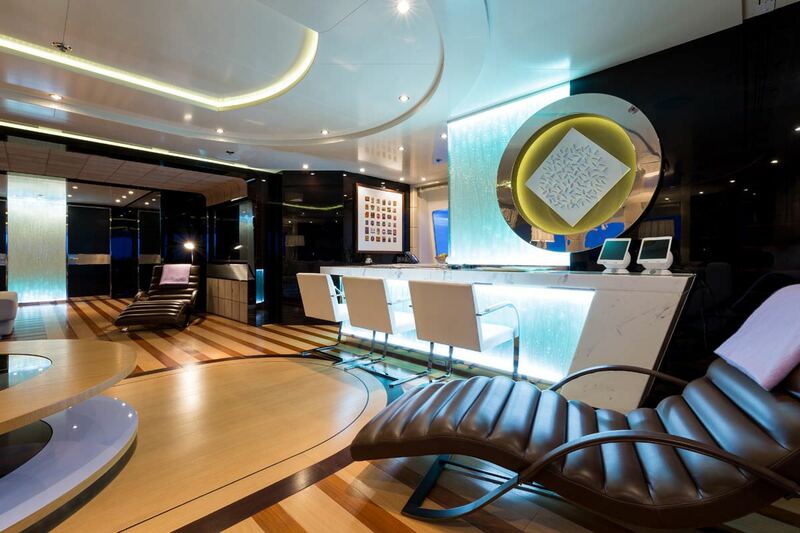 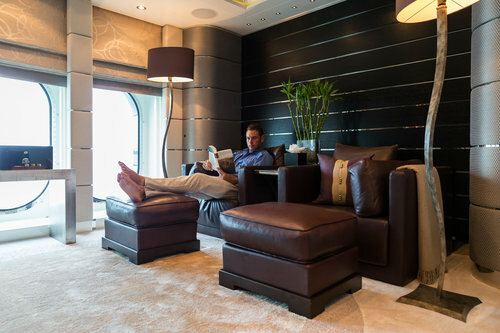 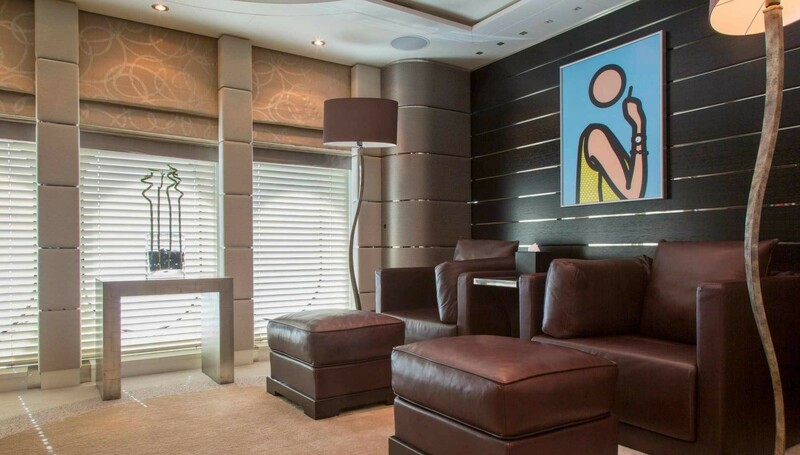 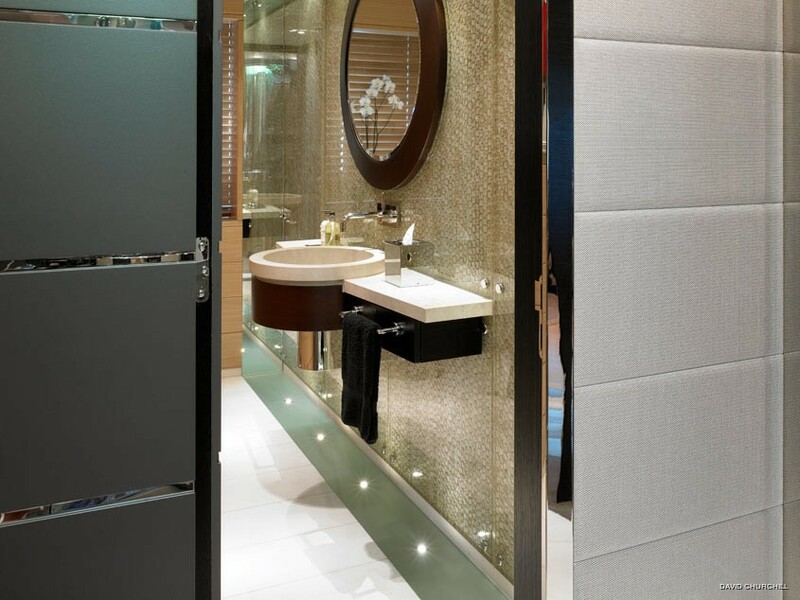 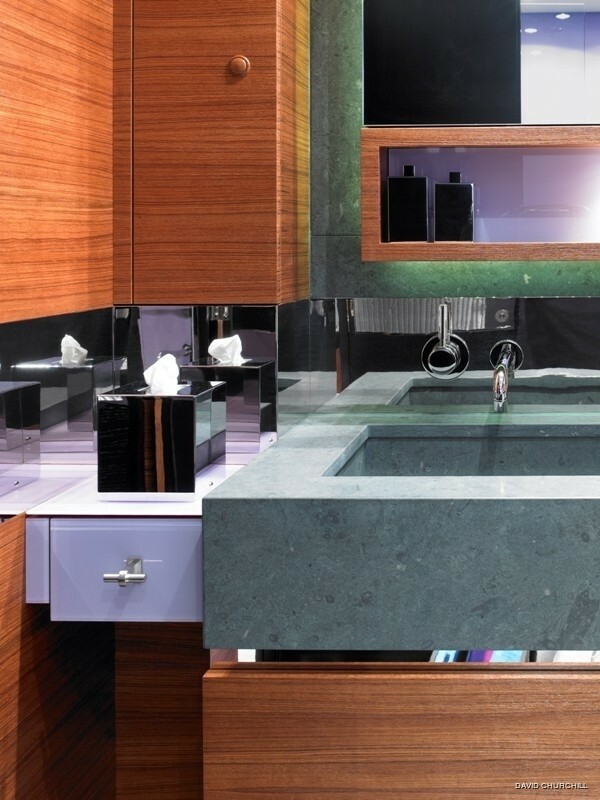 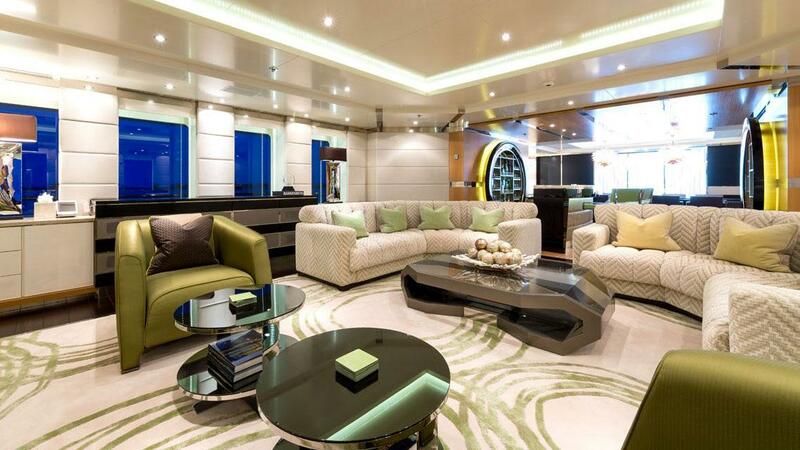 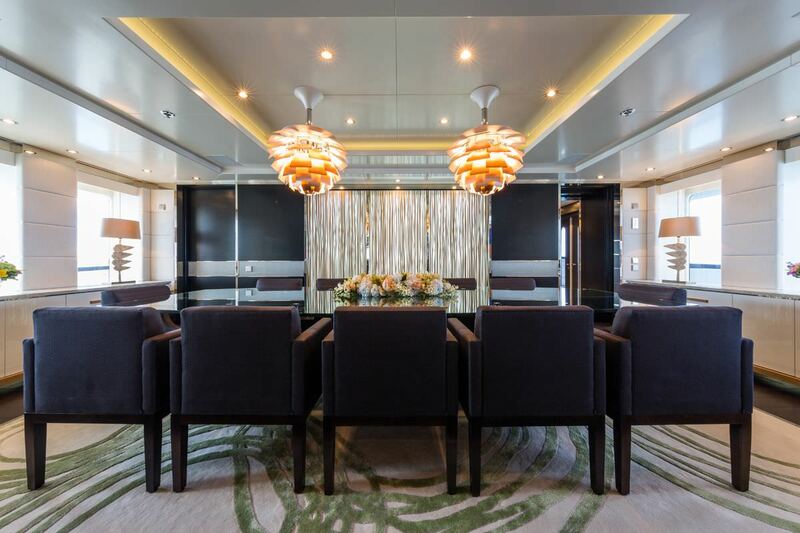 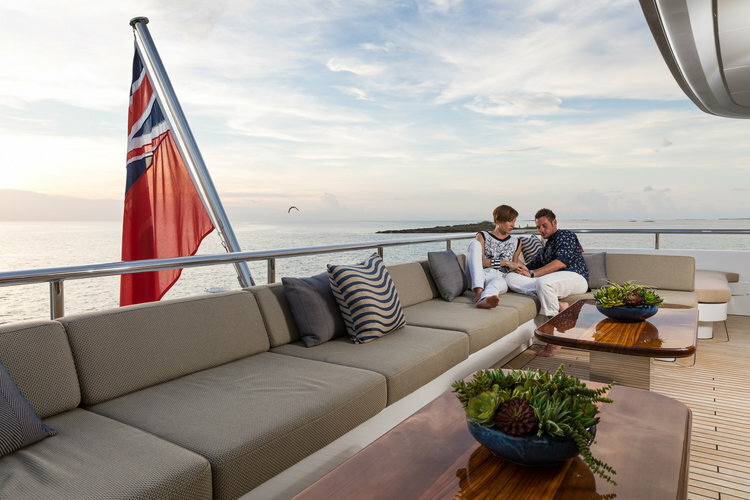 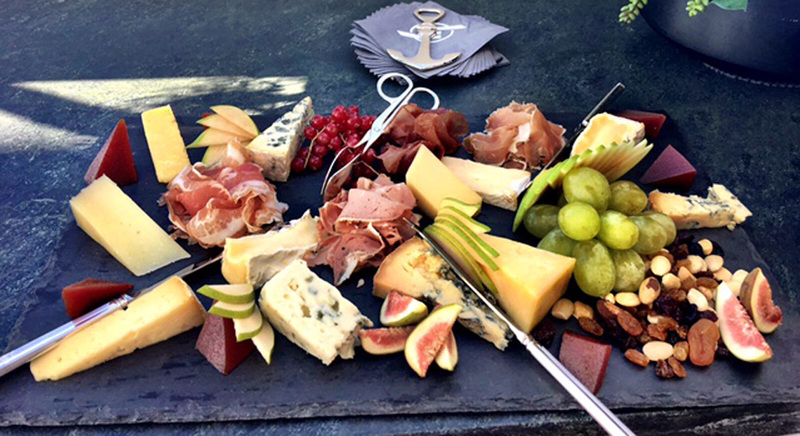 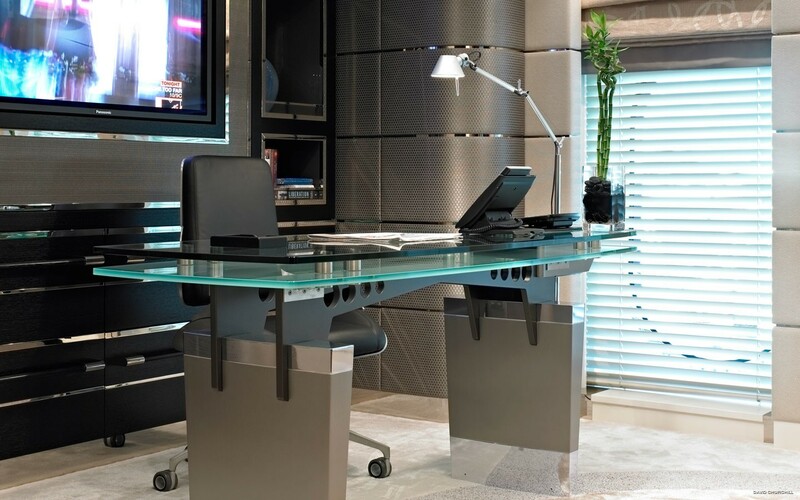 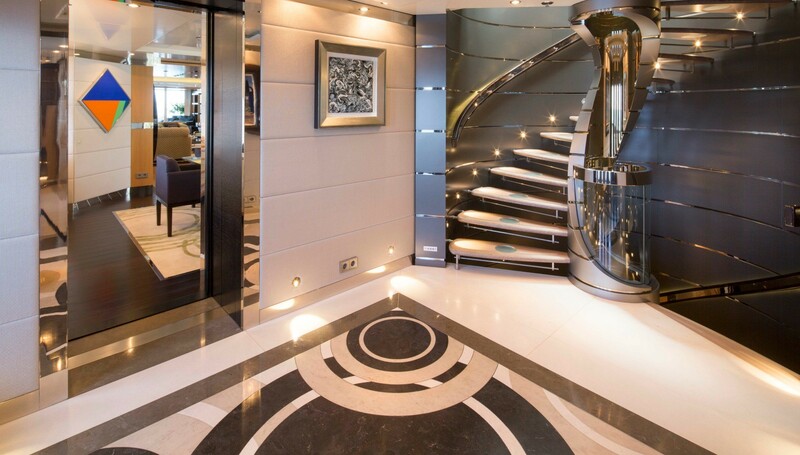 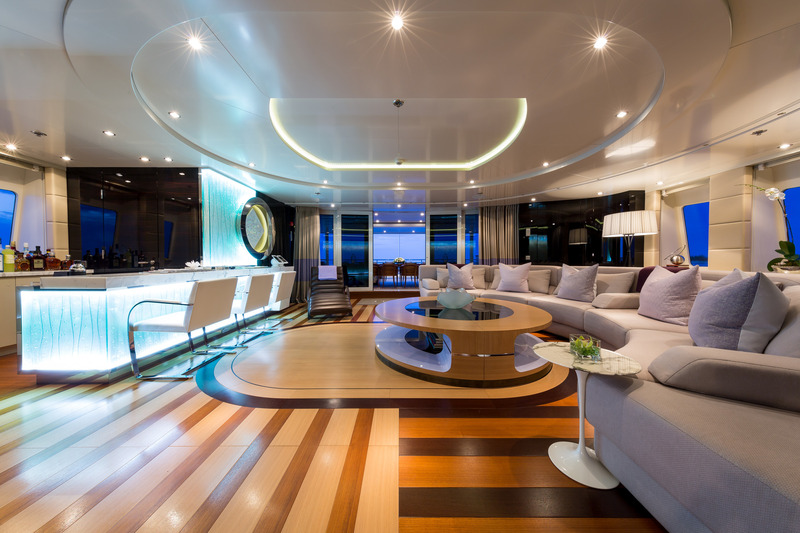 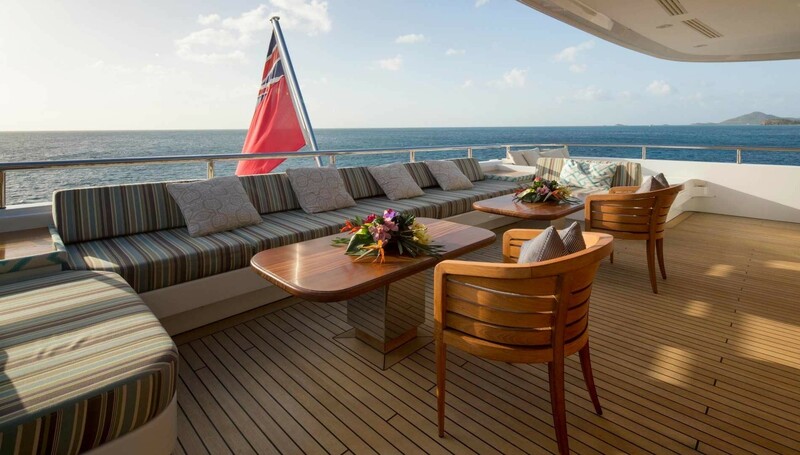 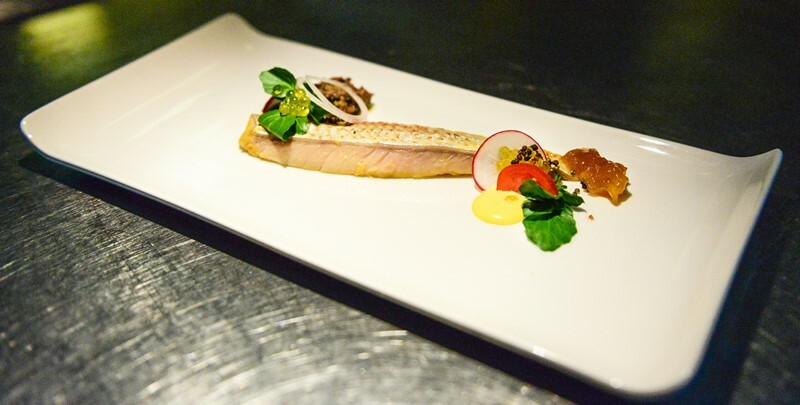 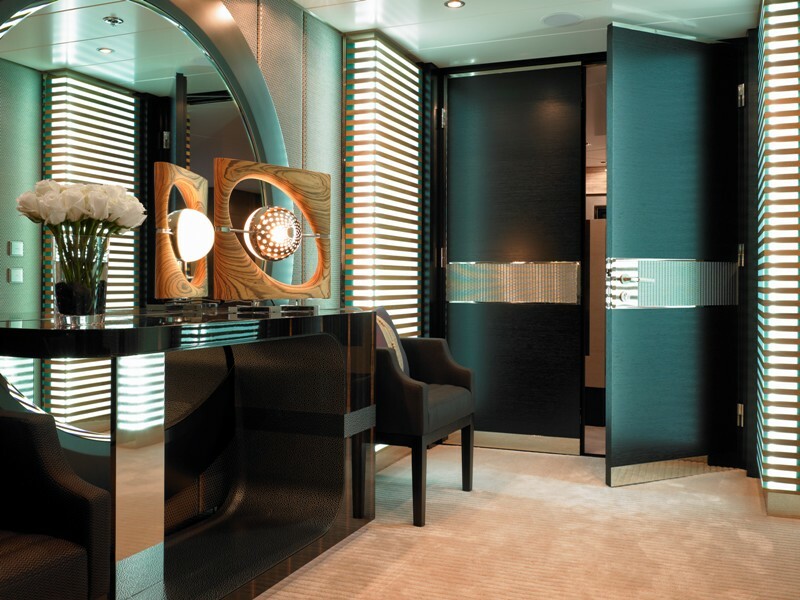 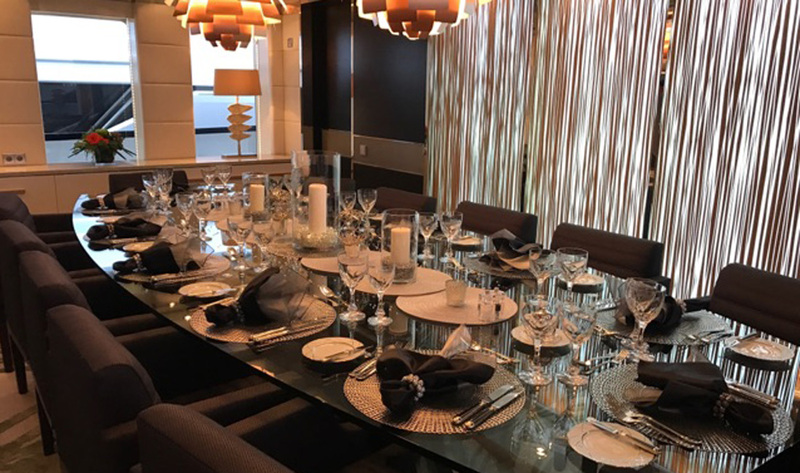 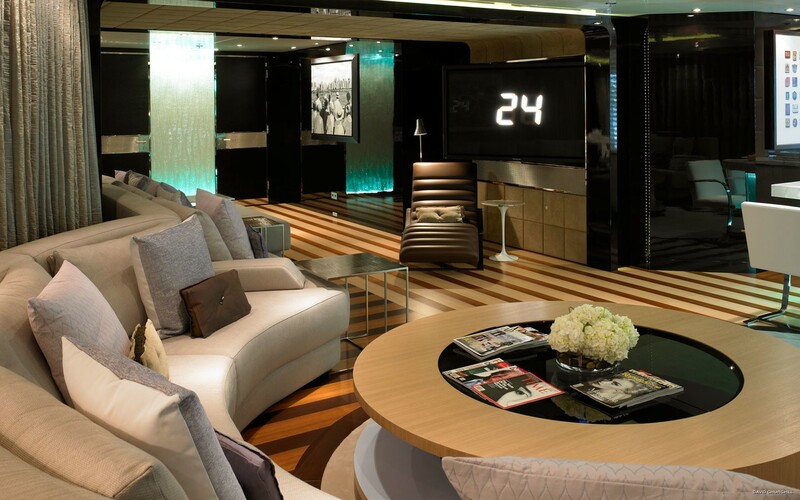 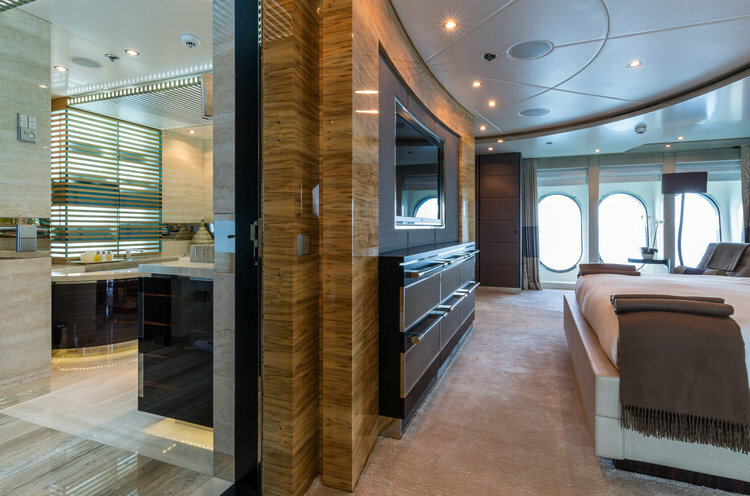 The yachts interior décor is bespoke, with custom styling and furnishings throughout. 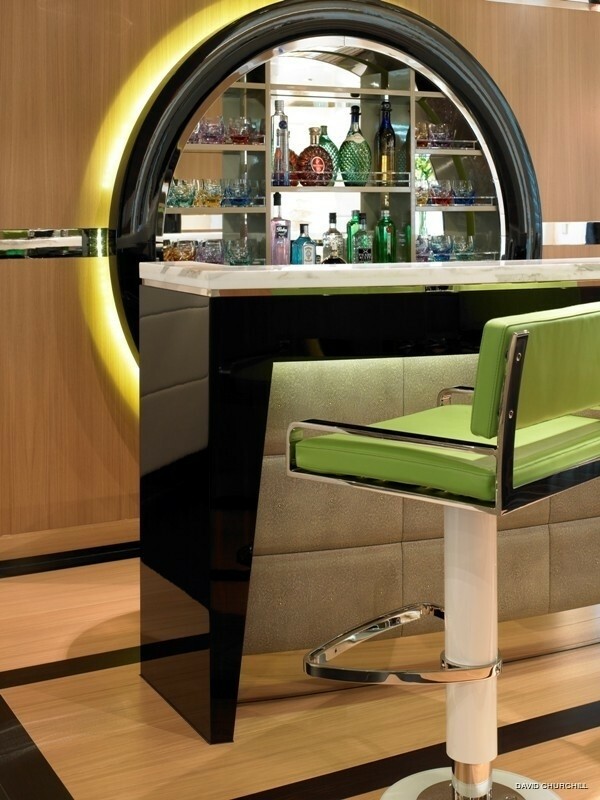 Her main salon offers ample plush furnishings and a complete wet bar, making it the ideal space for elegant entertaining. 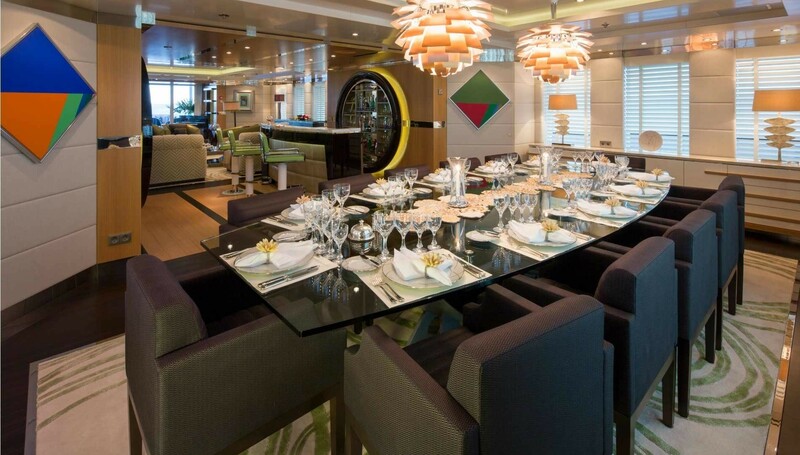 Further forward is a formal dining table, seating all 12 guests with ease. 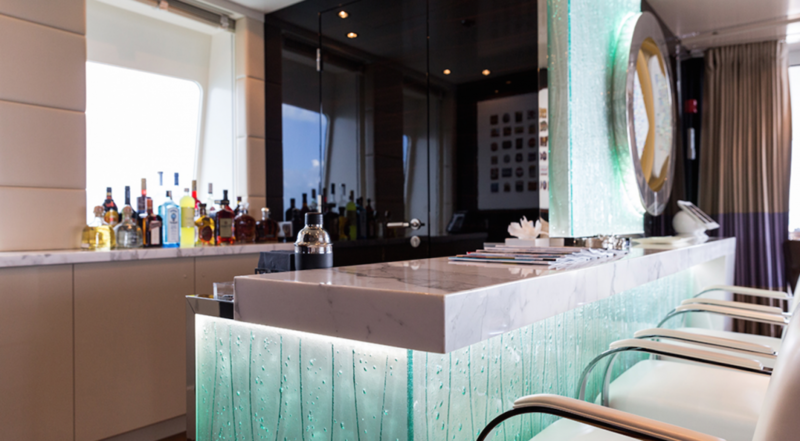 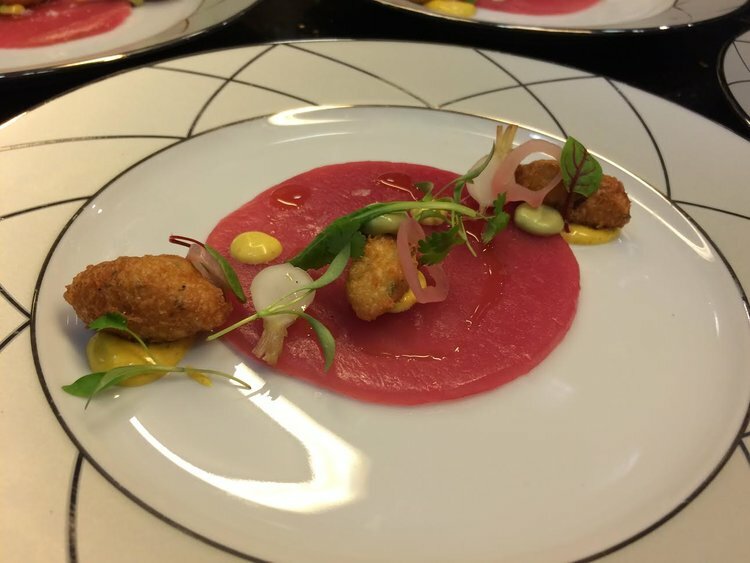 An upper skylounge offers an equally elegant atmosphere, with additional seating, tables and wet bar. 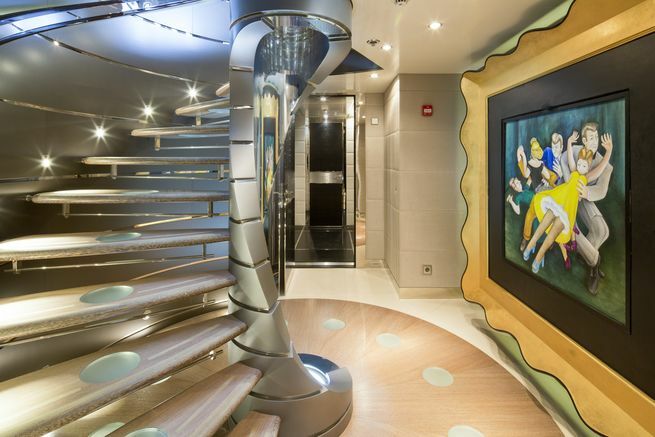 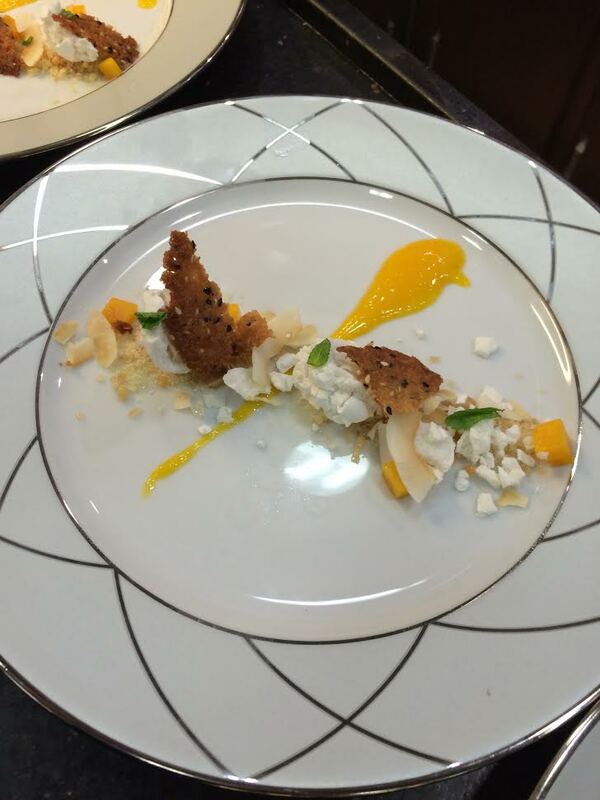 There is a day head on both the main level and upper level for guest’s convenience. 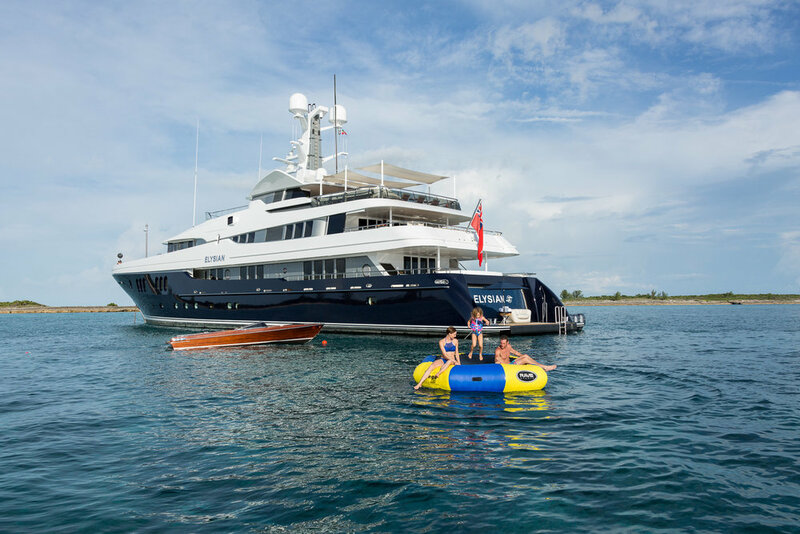 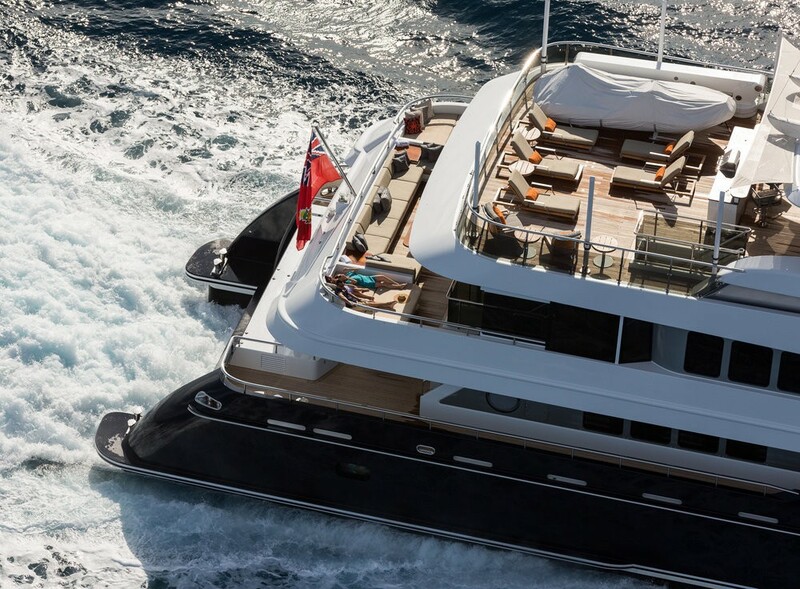 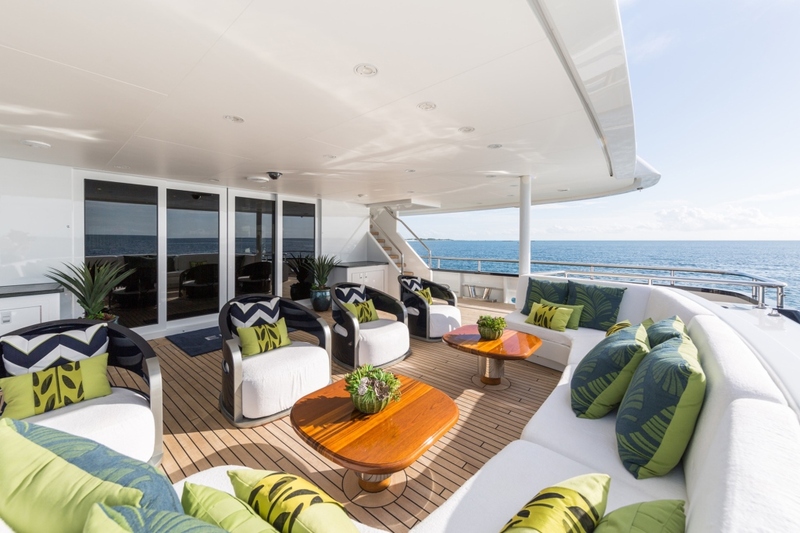 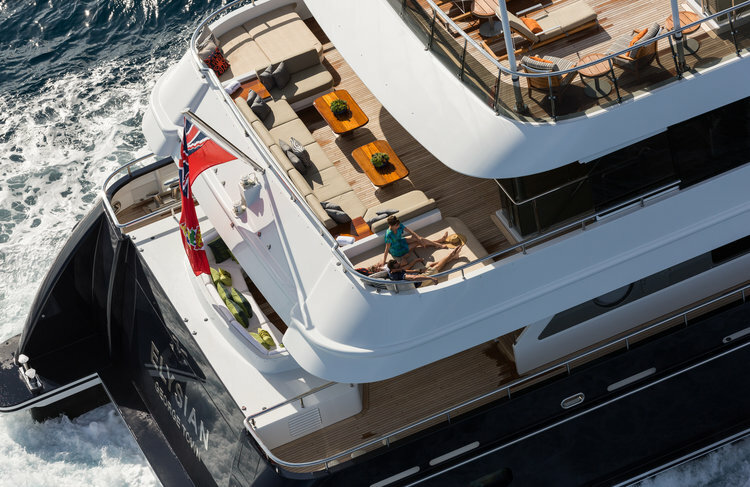 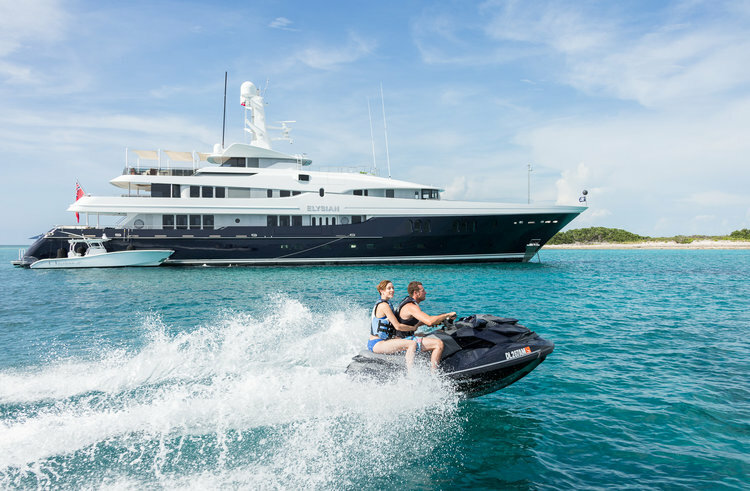 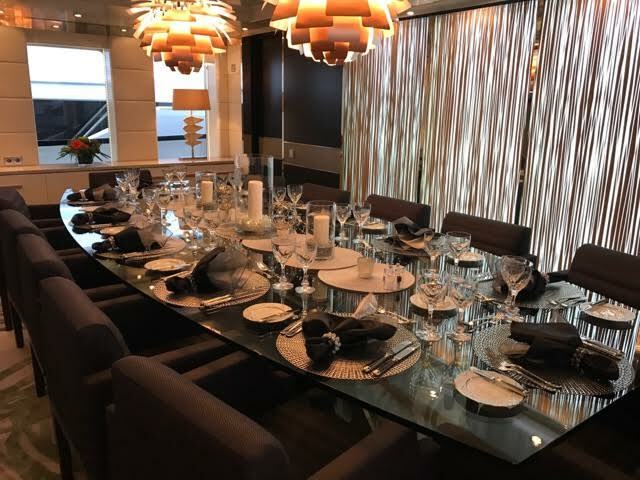 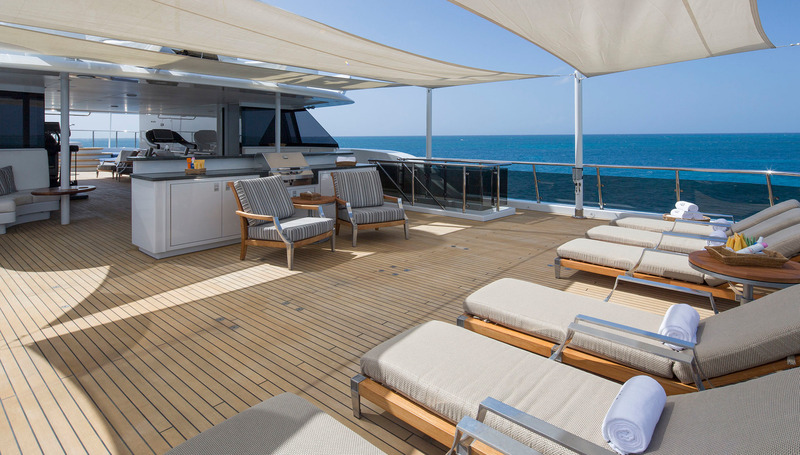 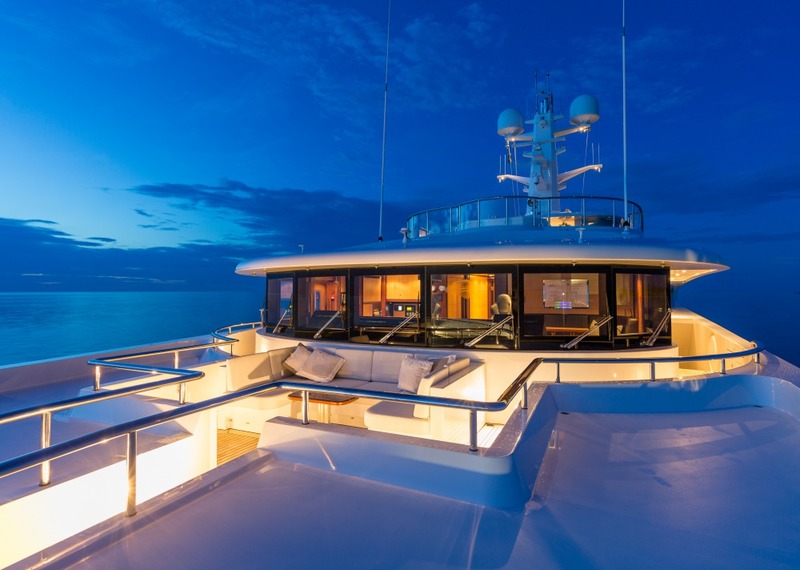 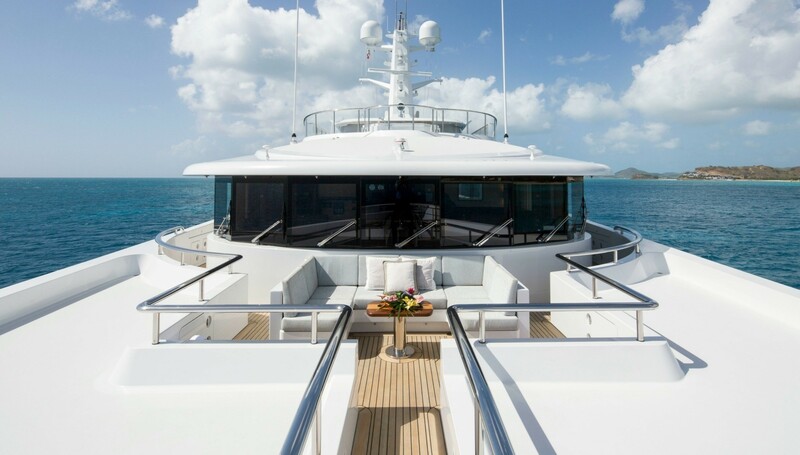 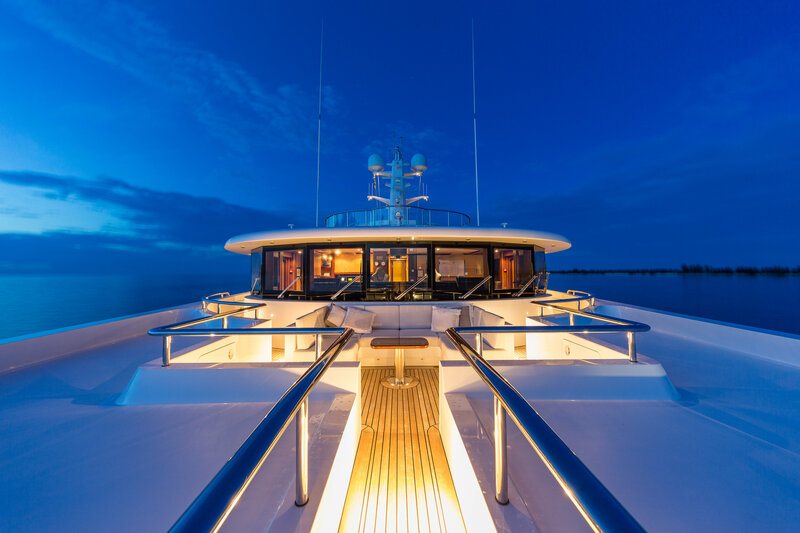 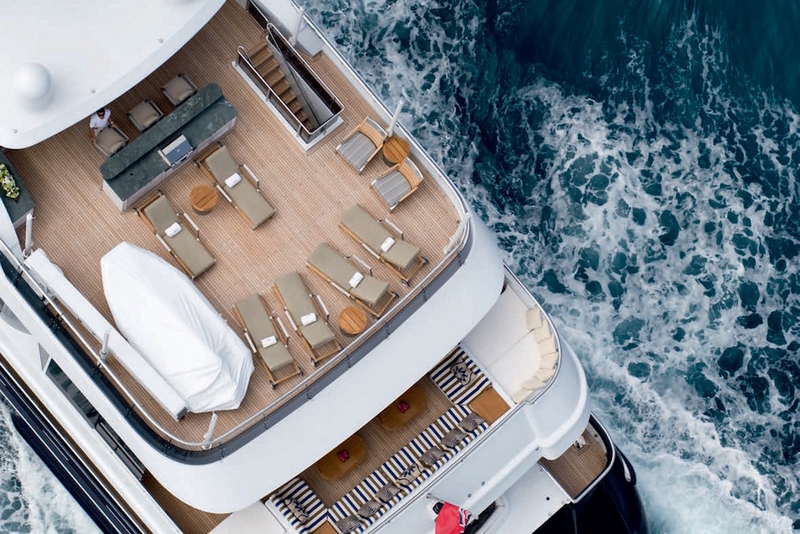 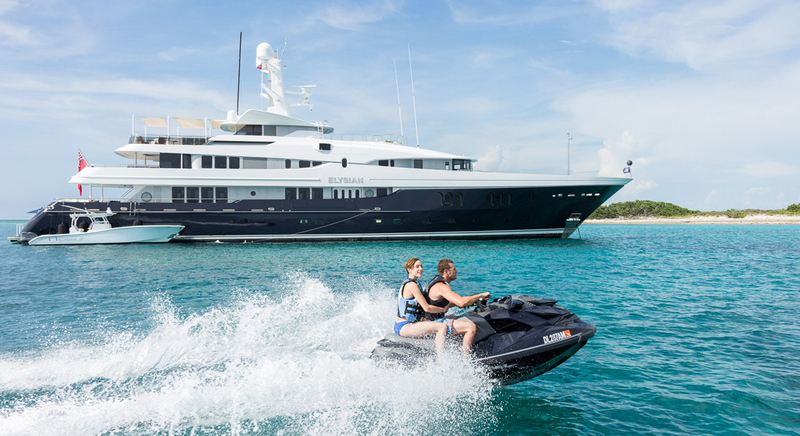 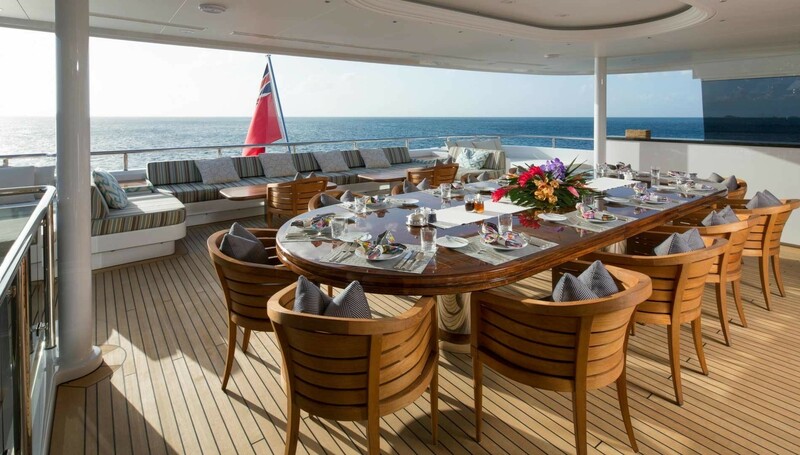 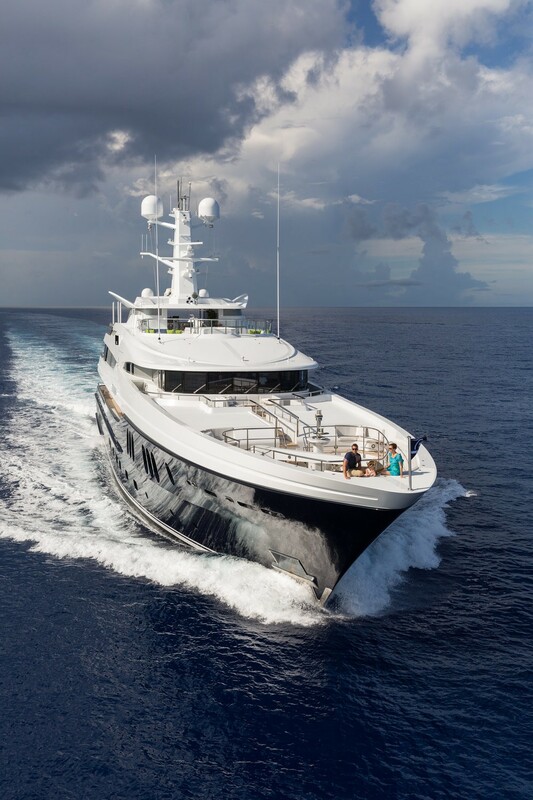 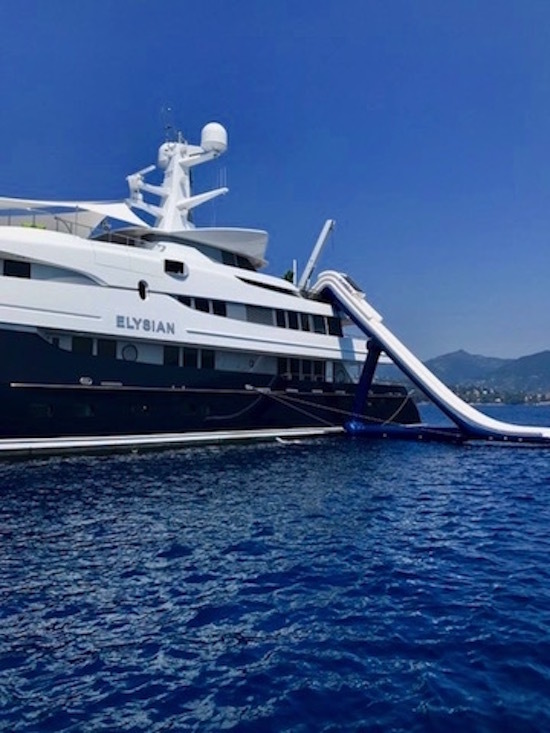 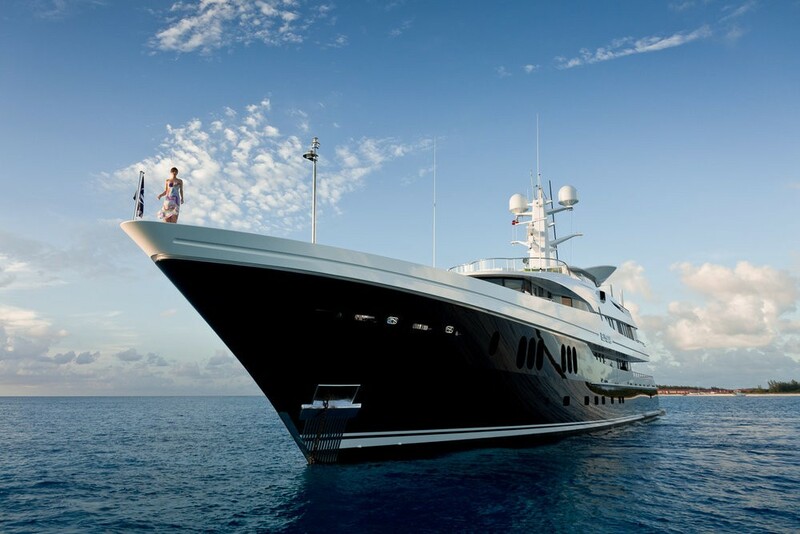 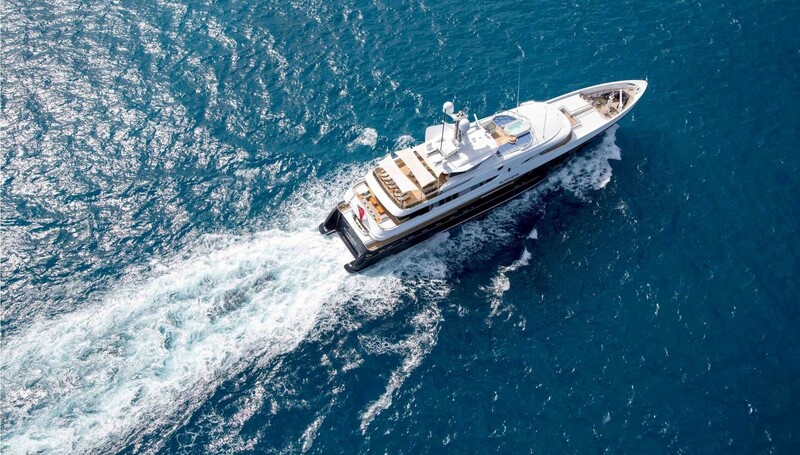 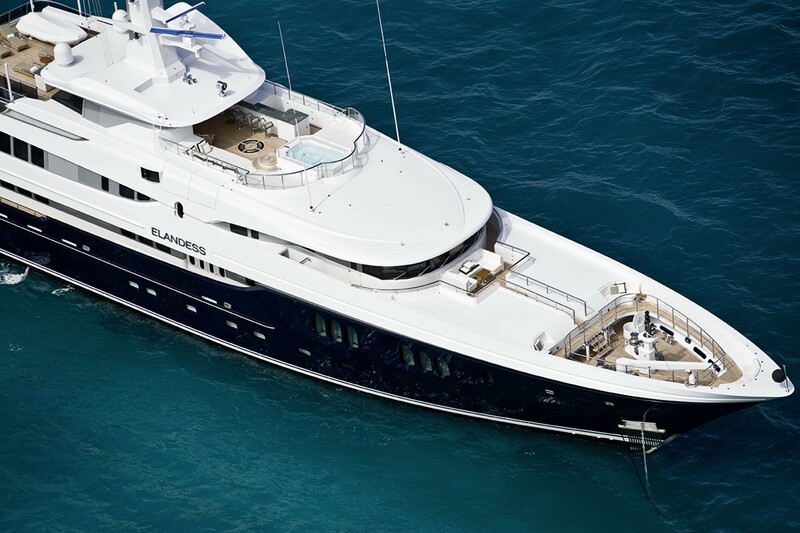 Luxury yacht ELYSIAN has four guest cabins on the lower deck and one king size double cabin of 90sqm on the main deck, plus a convertible cabin on the bridge deck, offering accommodation to 12 guests in total. 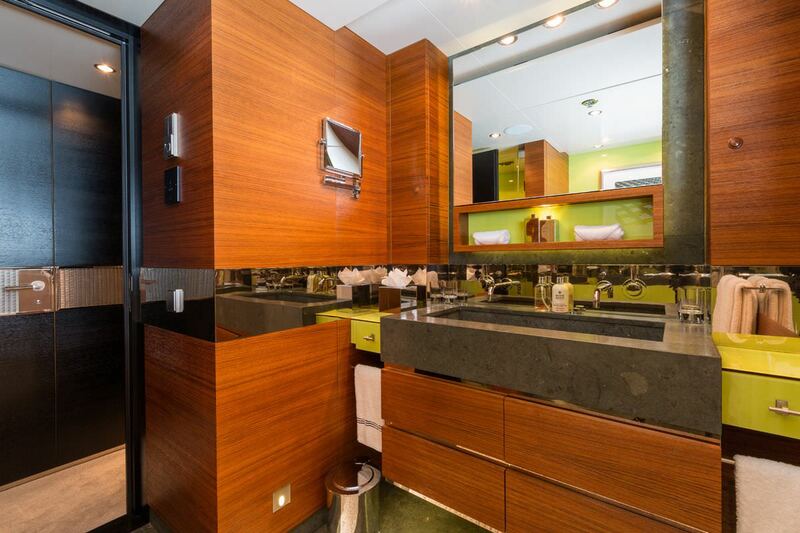 The guest cabin bathrooms are unique thanks to their decoration with untreated brushed teak cabinets, with carefully selected pastel shades. 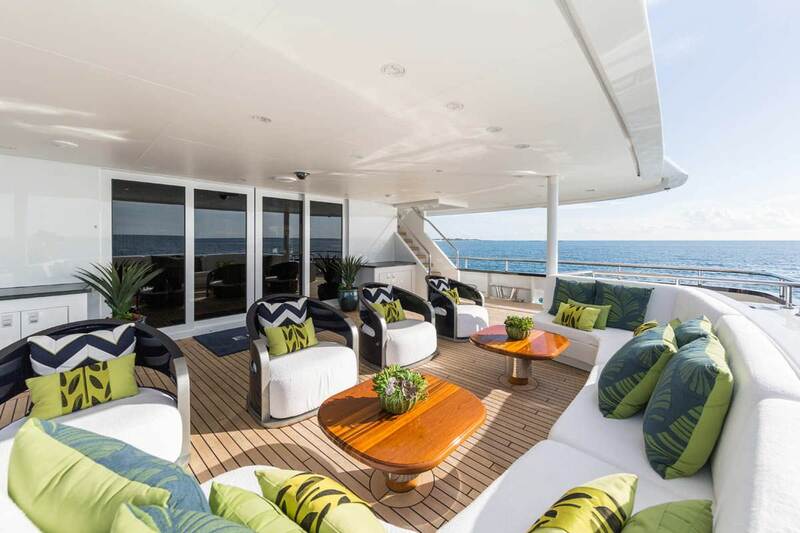 Exterior living is laid over 3 levels and boasts a vast amount of relaxation and entertaining areas. 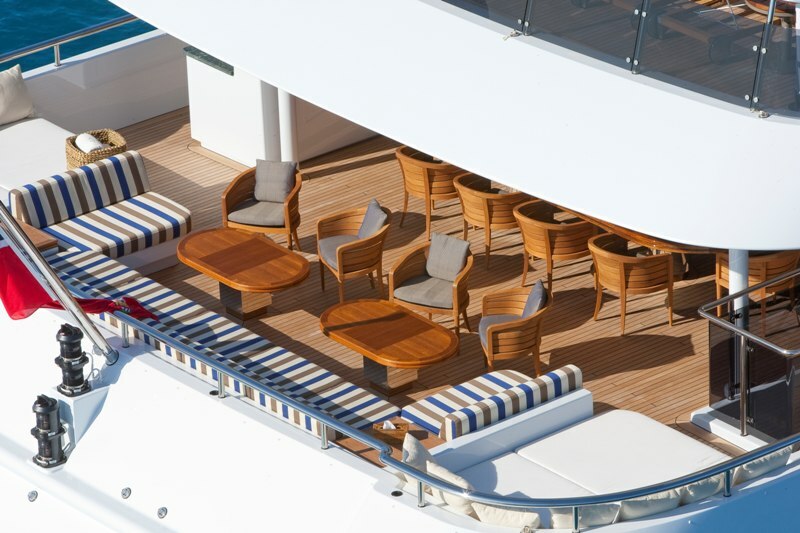 On the main deck aft, is a shaded seating space, with seating, tables and direct access to the main salon. 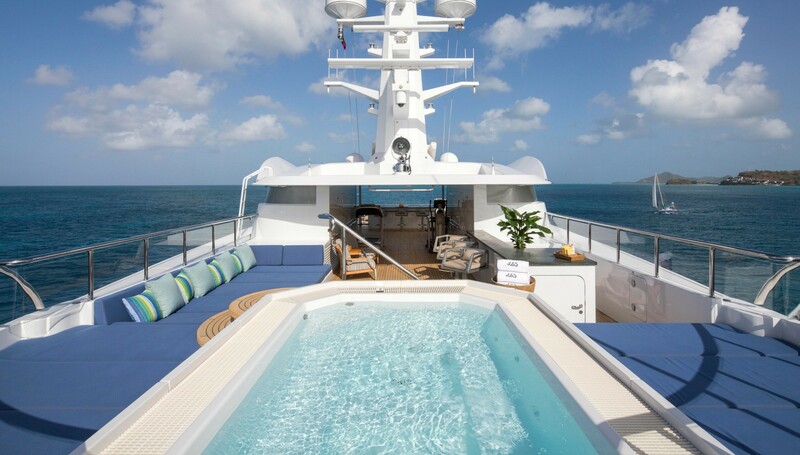 In addition, the aft deck provides steps leading to the extended swim platform and water activities center. 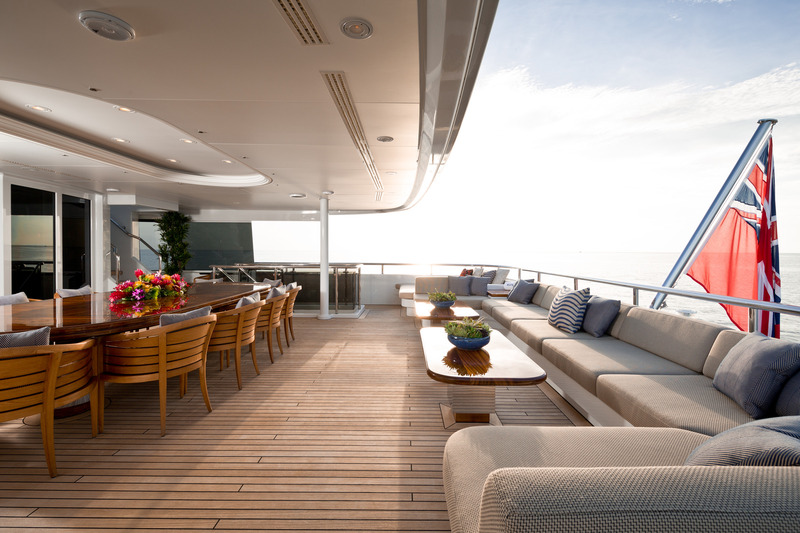 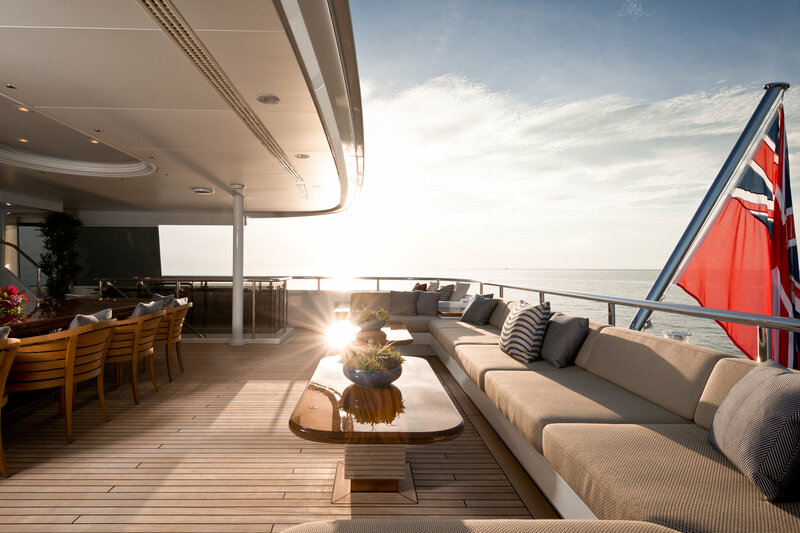 Her upper aft deck is adjacent to the skylounge, with partial shade, comfortable exterior seating and an alfresco dining option. 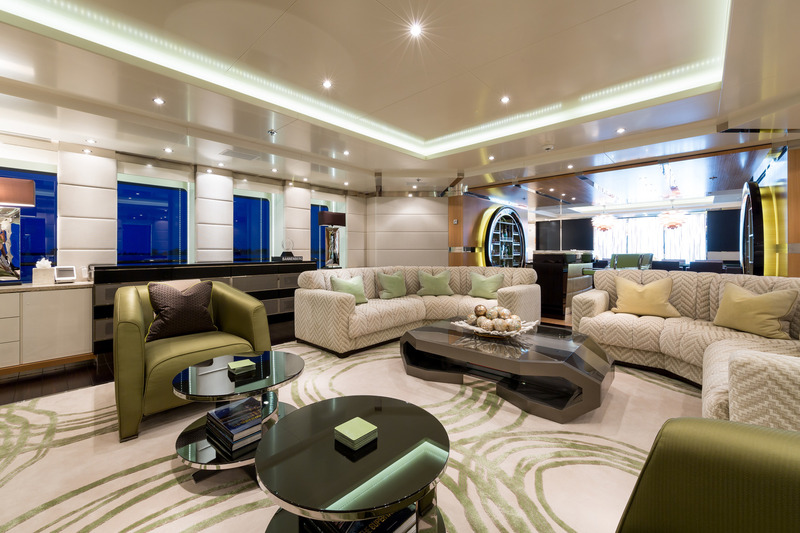 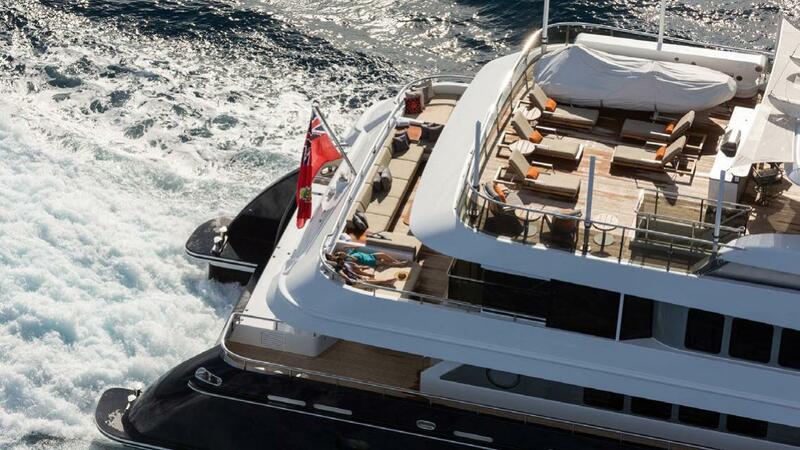 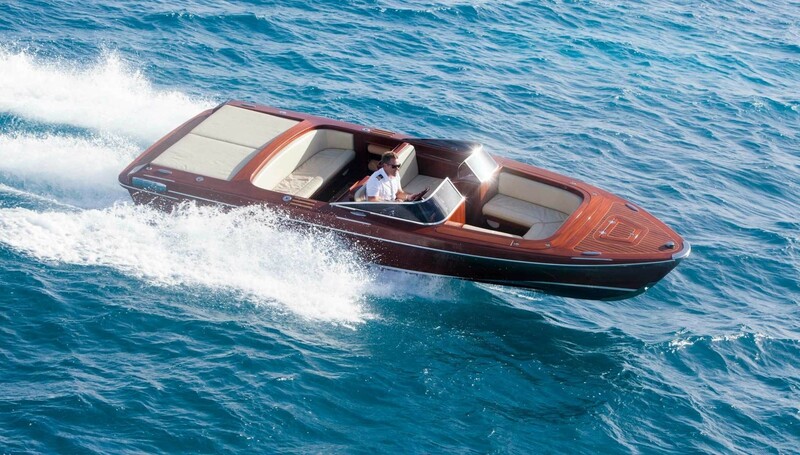 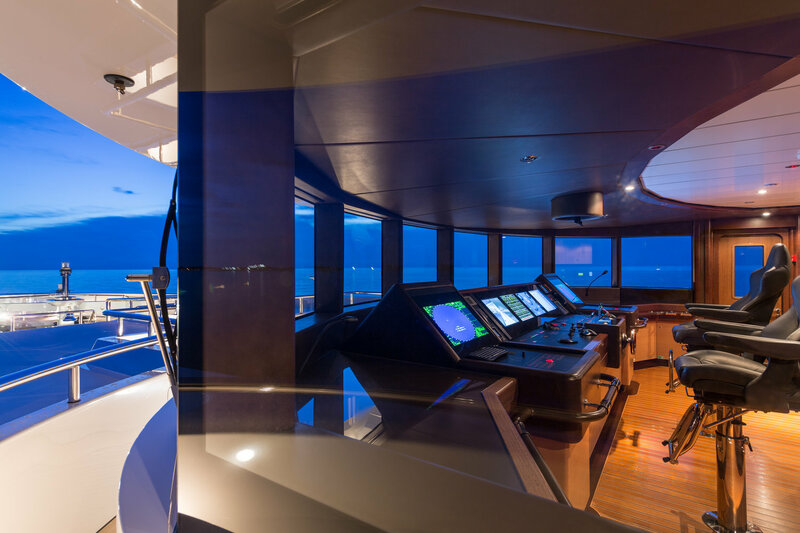 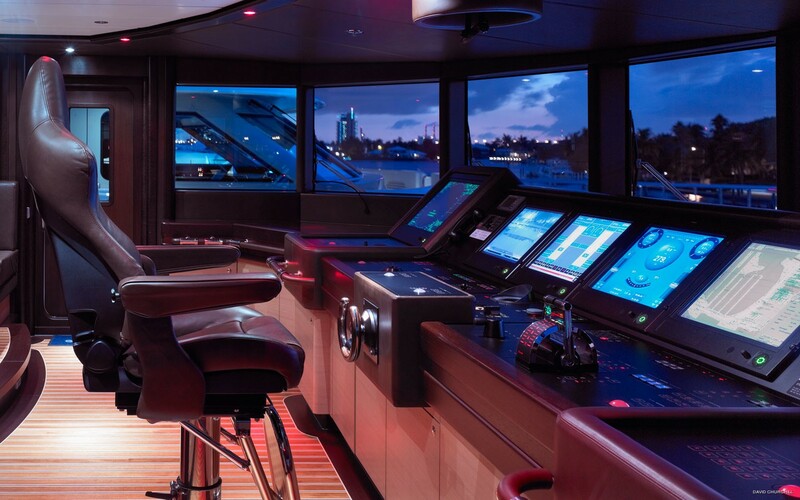 The yacht features a Portuguese styled bow seating area in front of the bridge. 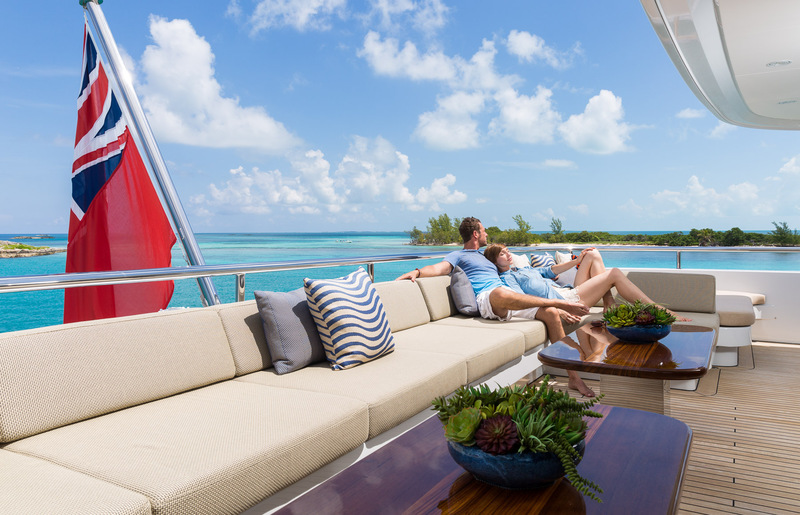 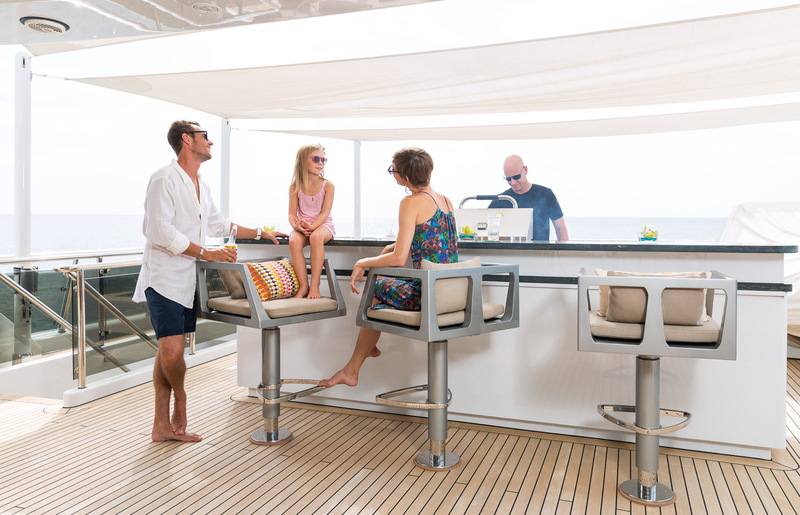 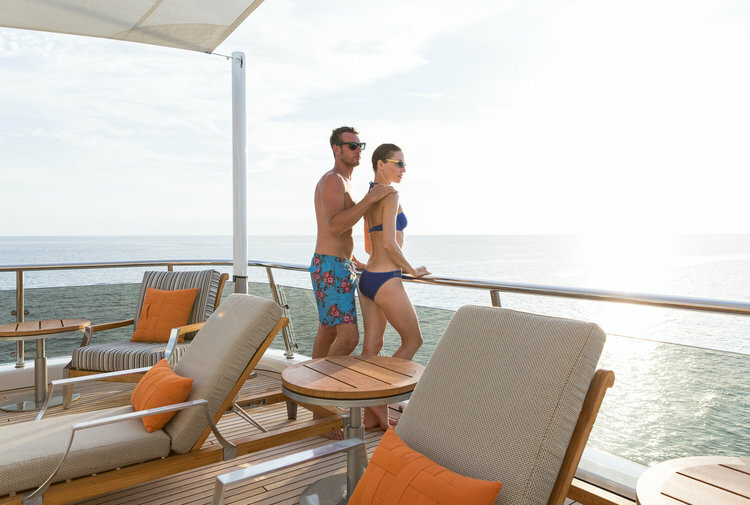 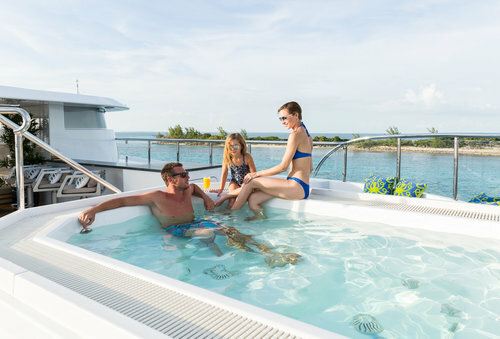 A functional sundeck offers ample sunning on sunpads and chaise loungers, a deluxe Jacuzzi tub, wet bar, seating and partial shade. 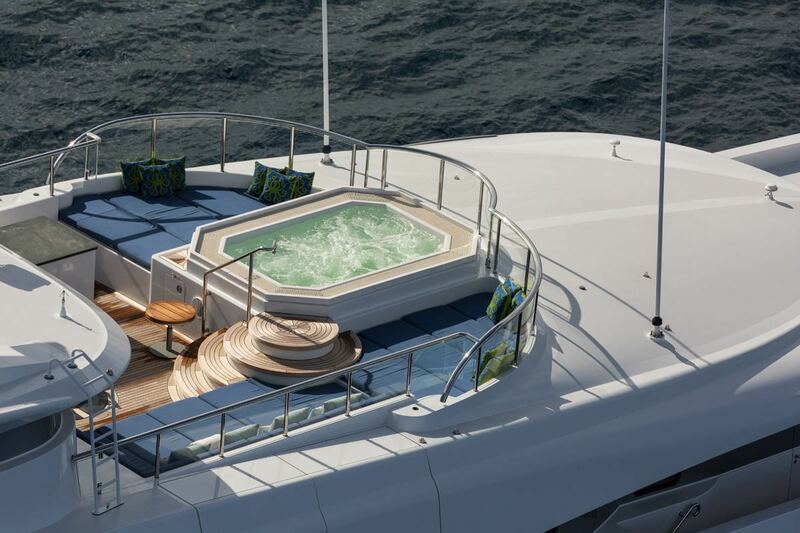 Exterior day heads are also available on the swim platform and sundeck. 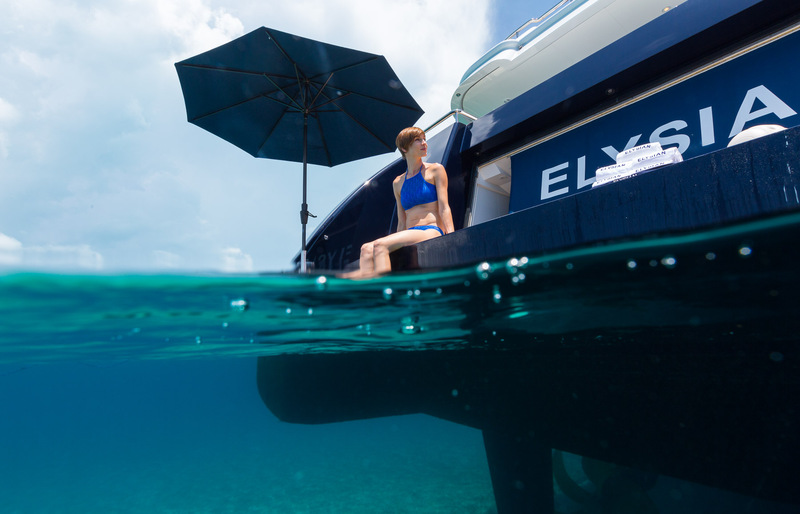 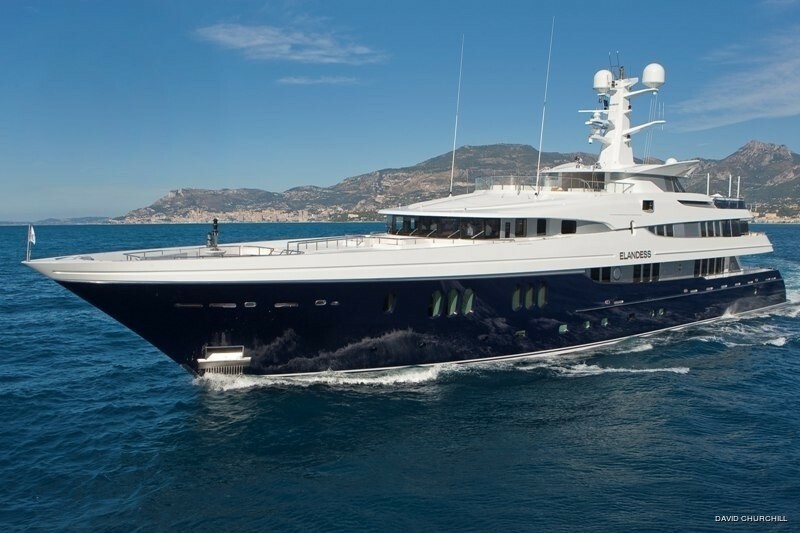 ELYSIAN (Ex Elandess) yacht has a steel hull and aluminum superstructure with a beam of 10.7 meters (35.10ft) and a 3.5 meter (11.48ft) draft. 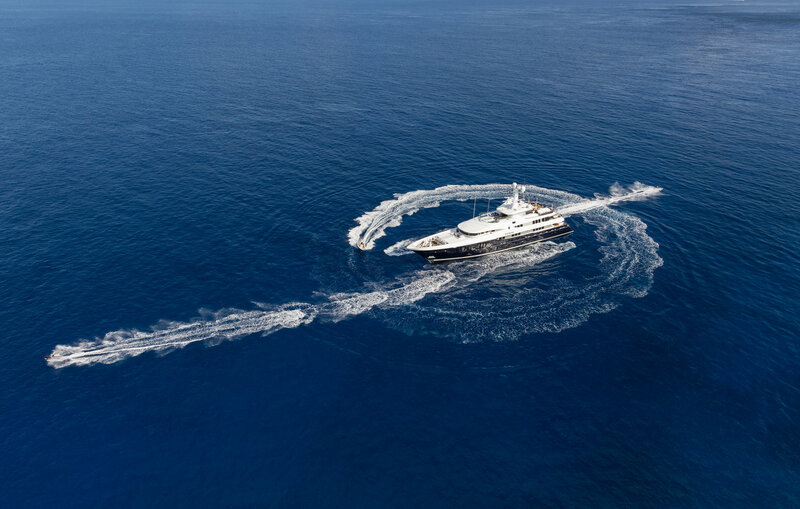 She is powered by 2 Caterpillar engines, with a cruising speed of 14 and a maximum speed of 16 knots allowing a range of more than 4000 nautical miles. 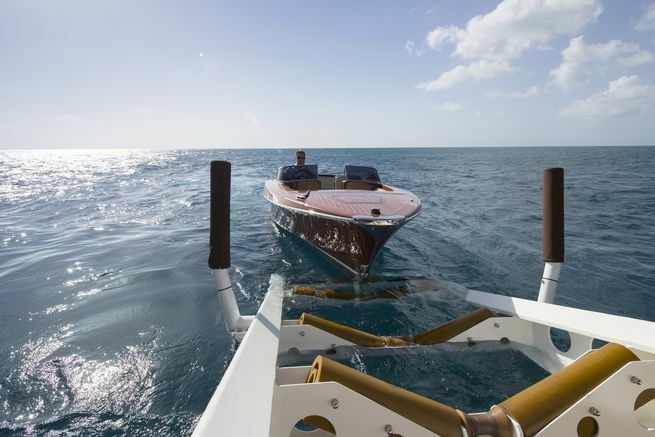 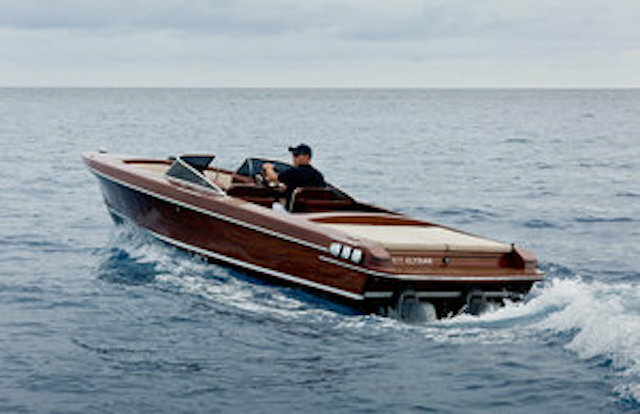 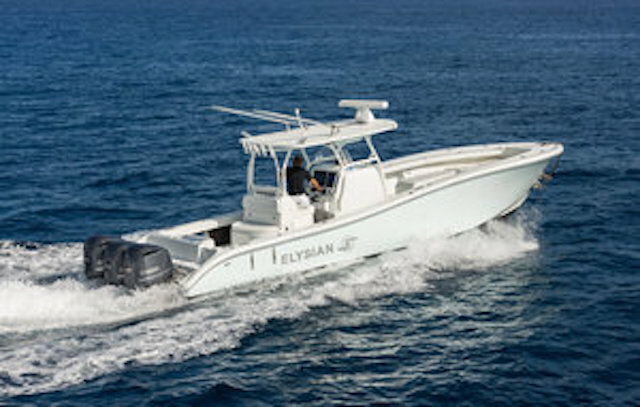 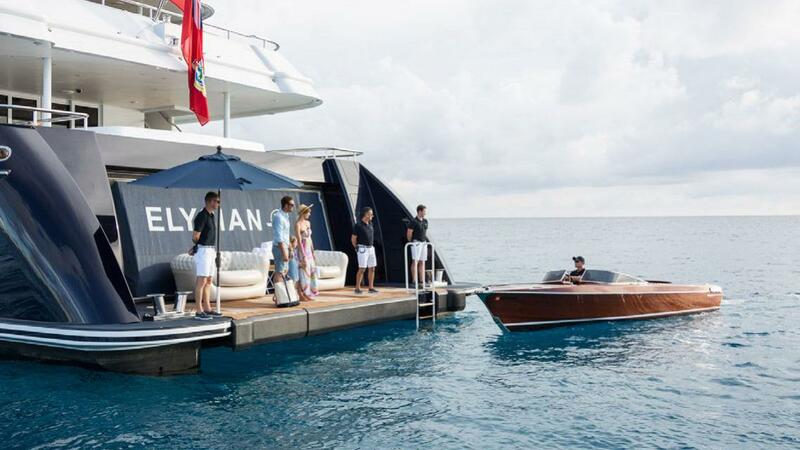 Two tenders can be launched while ELYSIAN yacht is underway thanks to the innovative Abeking & Rasmussen stern launching system. 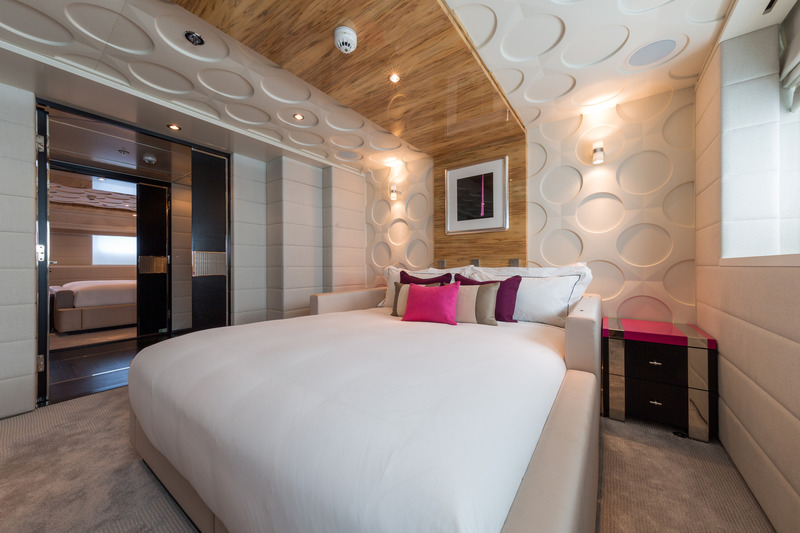 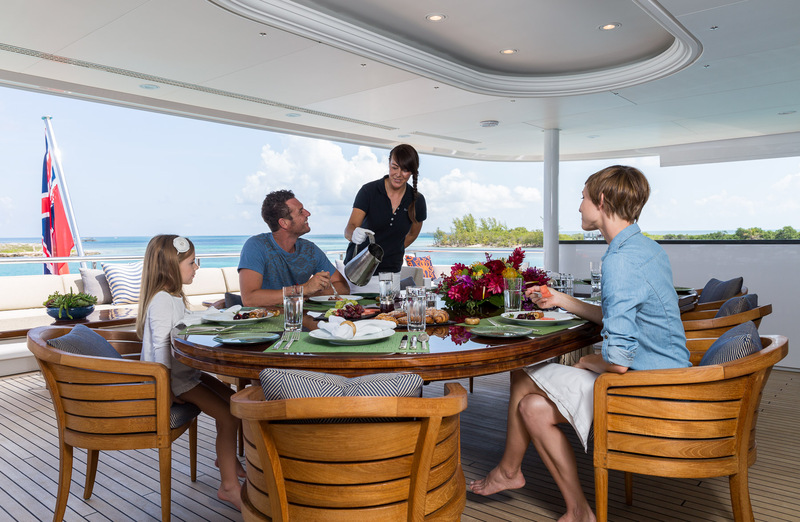 Accommodation is in 6 cabins, for up to 12 charter guests. 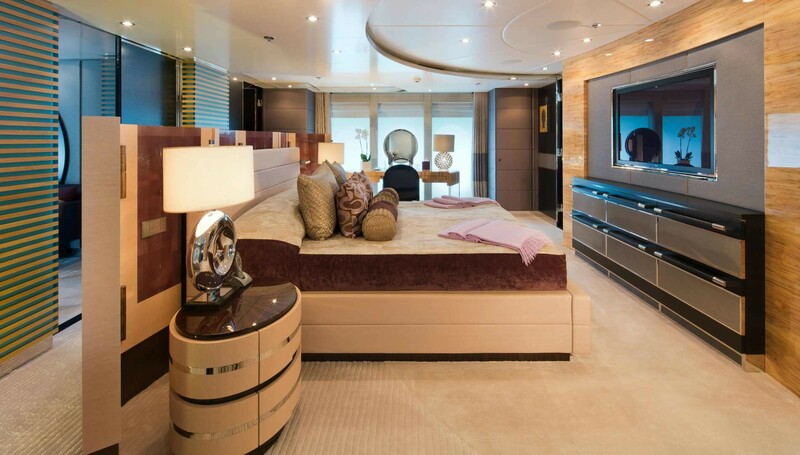 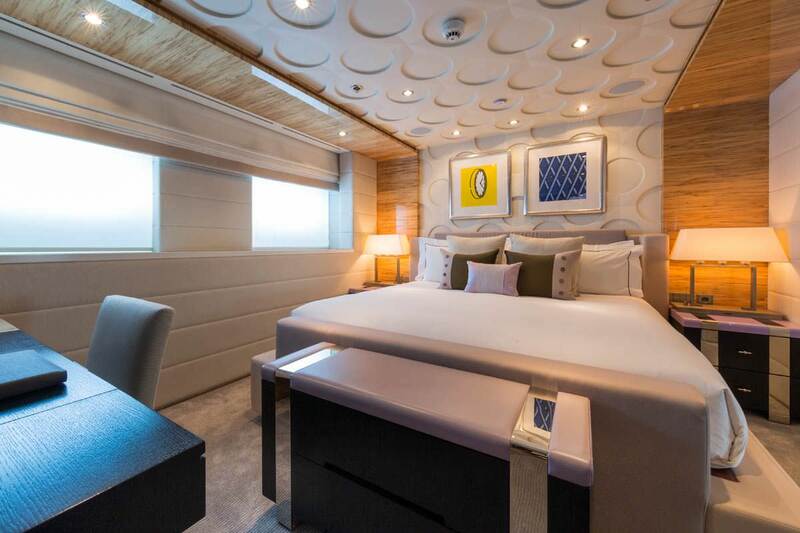 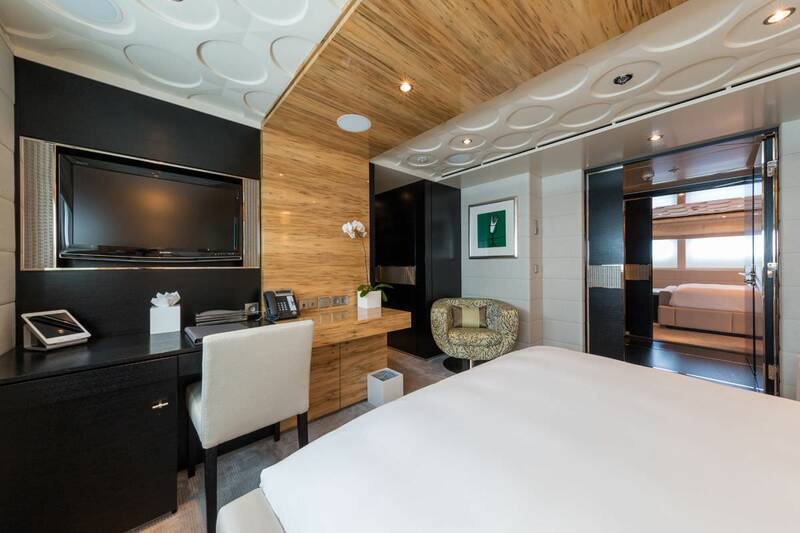 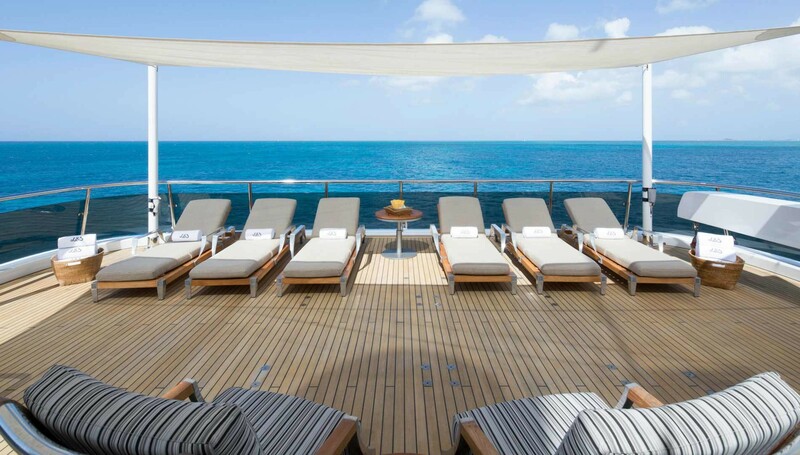 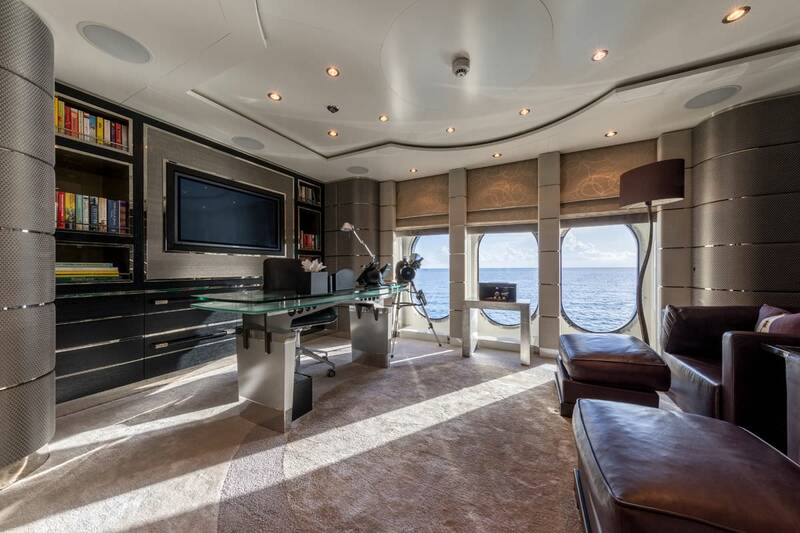 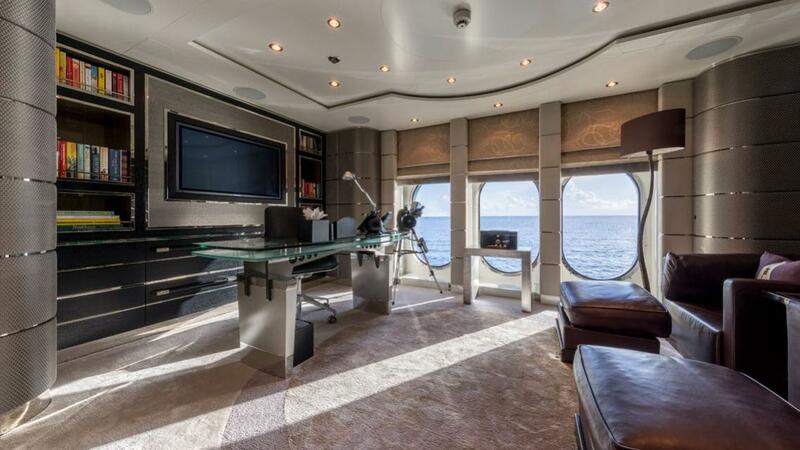 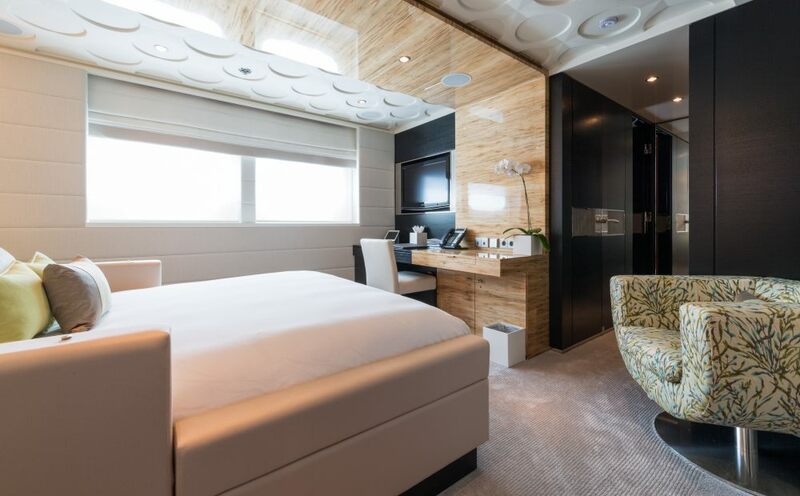 The master stateroom is opulent and spacious on the main deck, forward of the salon and full beam of the yacht. 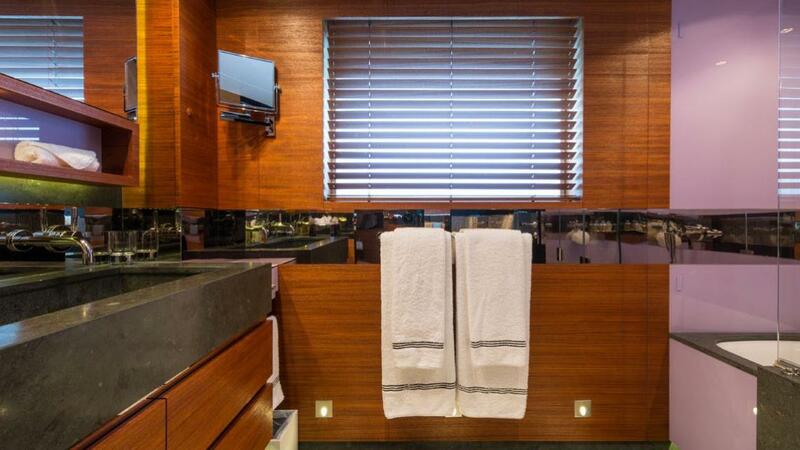 Upon entering the master cabin, there is a private office, complete with it’s own en-suite. 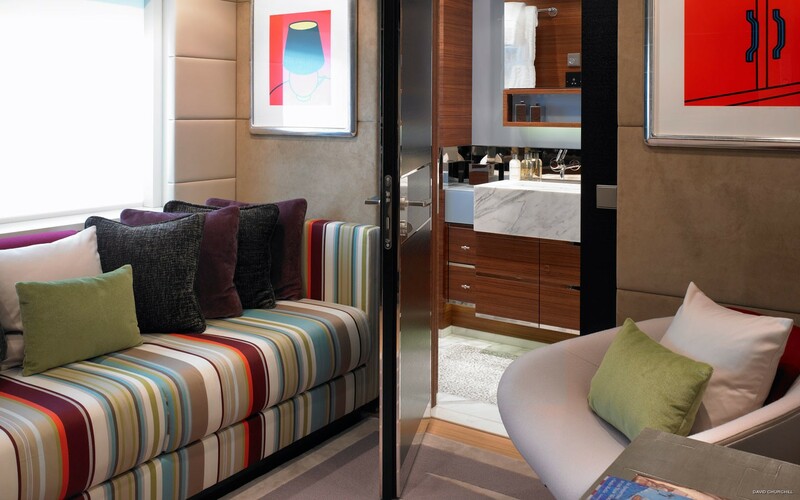 The main cabin offers a king size bed, seating areas, his and hers walk in wardrobes as well as his and hers ensuites. The master stateroom features large oval windows, ensuring a light and airy atmosphere, while providing fabulous views. 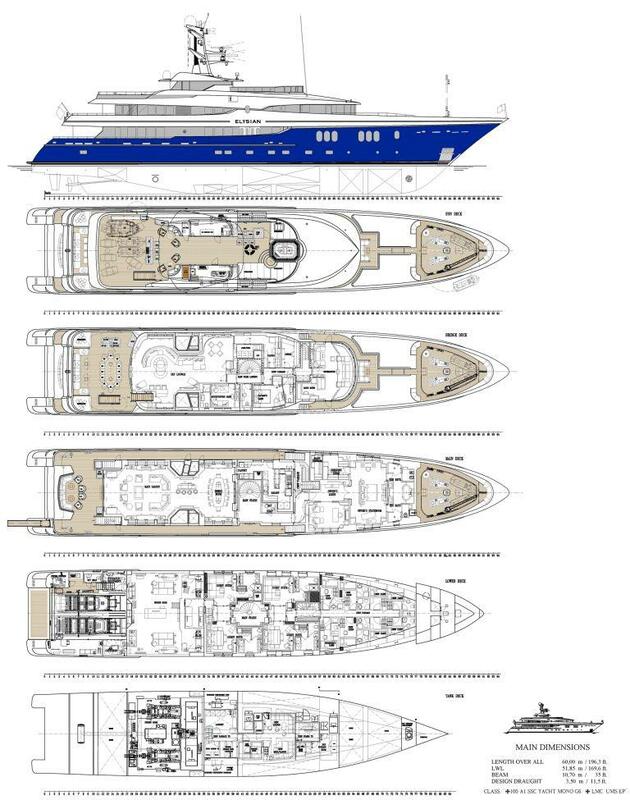 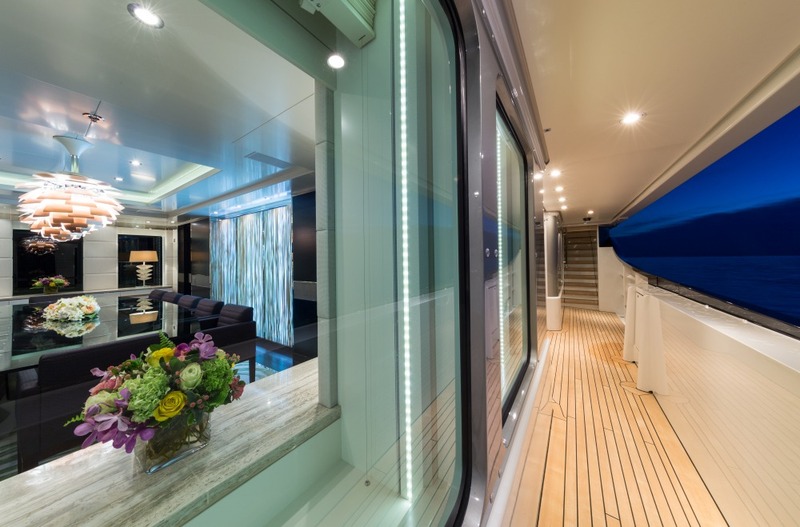 A convertible cabin / playroom / masseuse room is on the upper deck, forward of the skylounge to starboard. 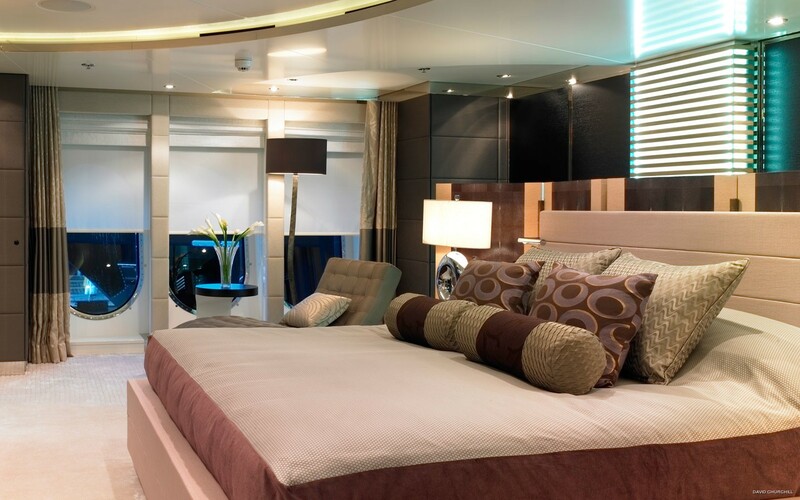 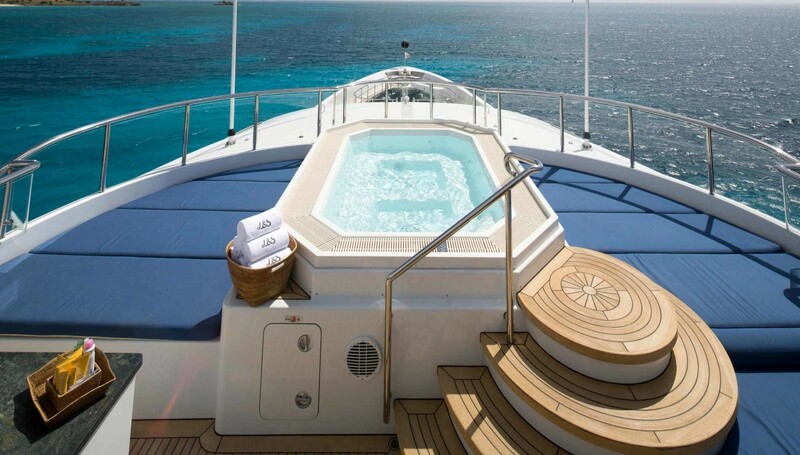 On the lower deck are 4 cabins, 2 with king size beds, vanity and ensuite with Jacuzzi tub. 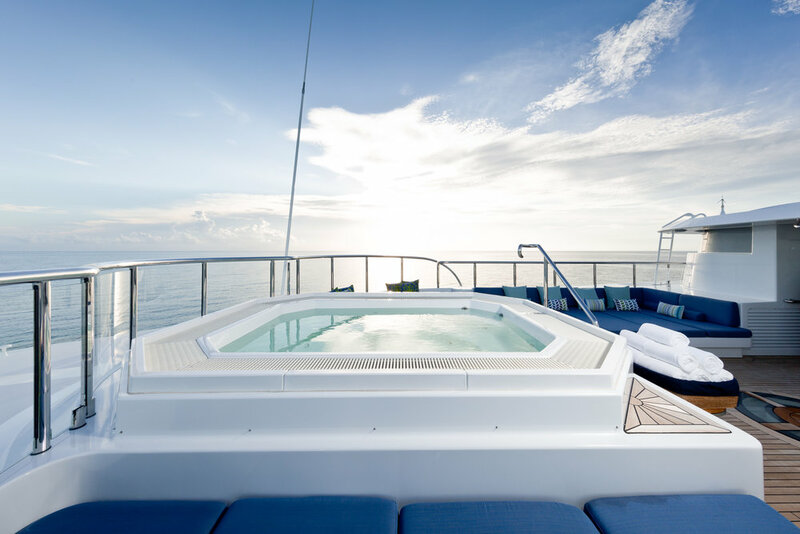 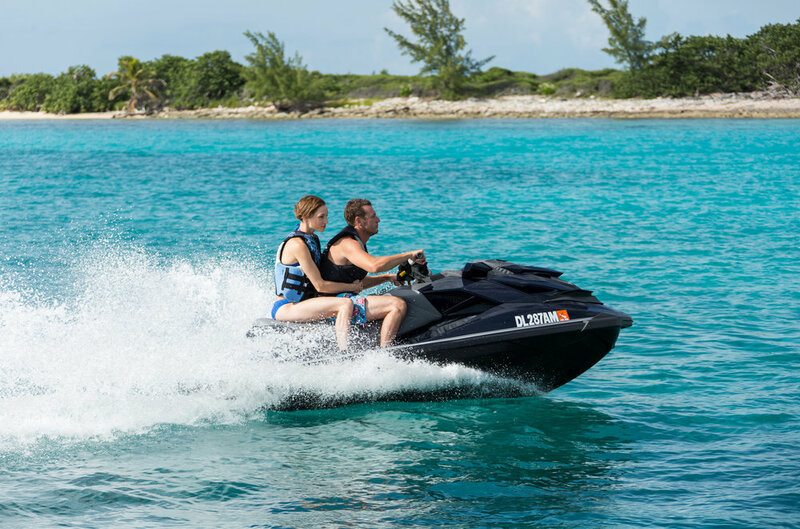 Two further cabins are convertible from twin to queen and have seating and ensuite with shower. 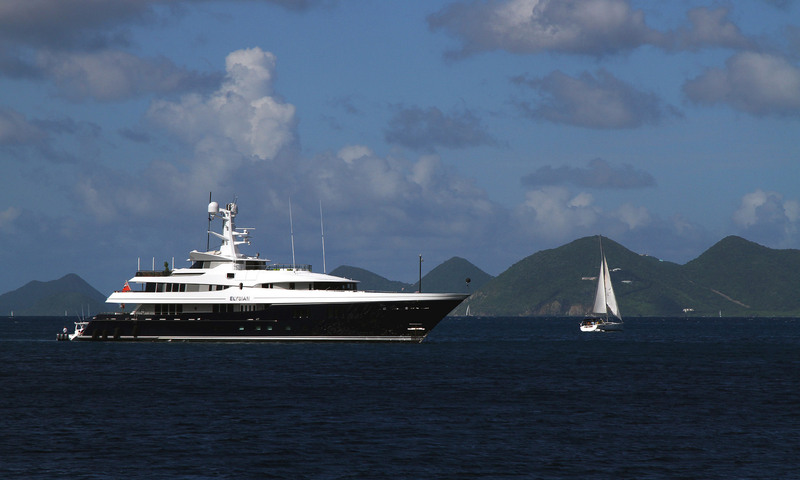 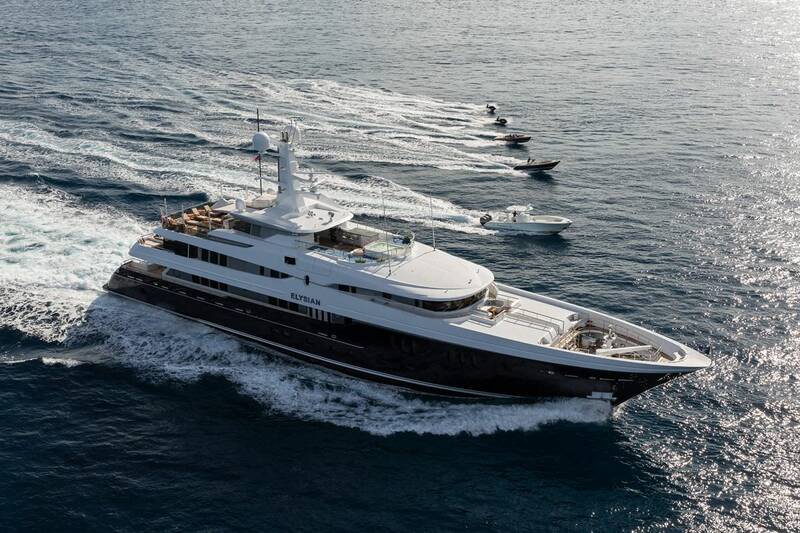 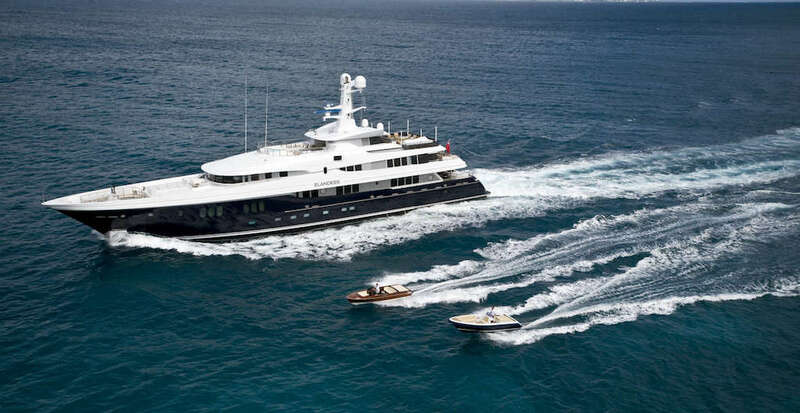 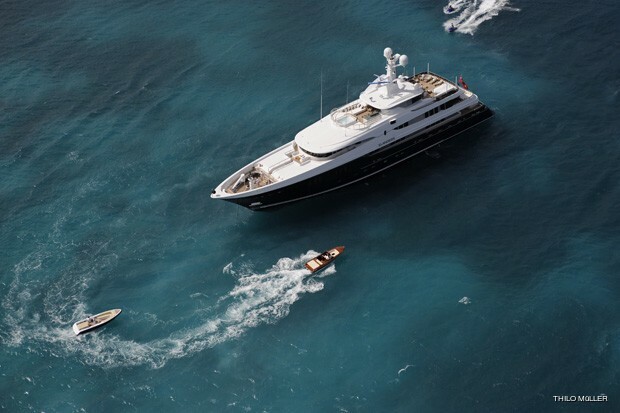 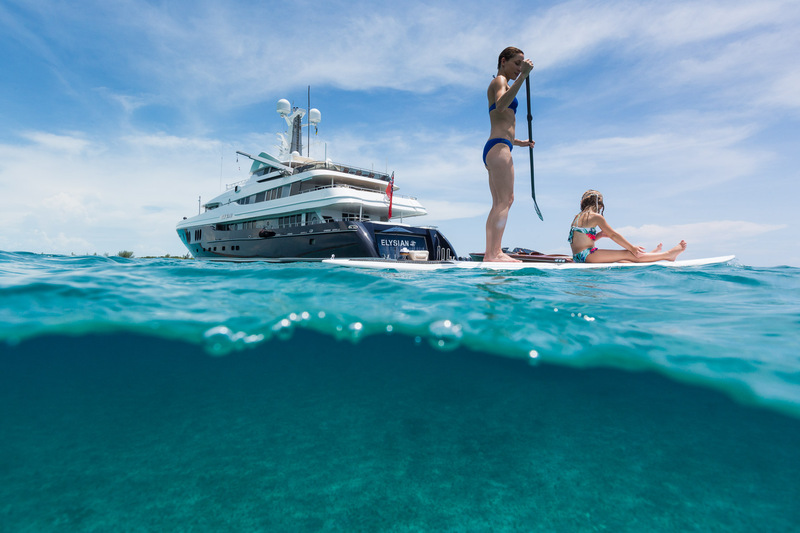 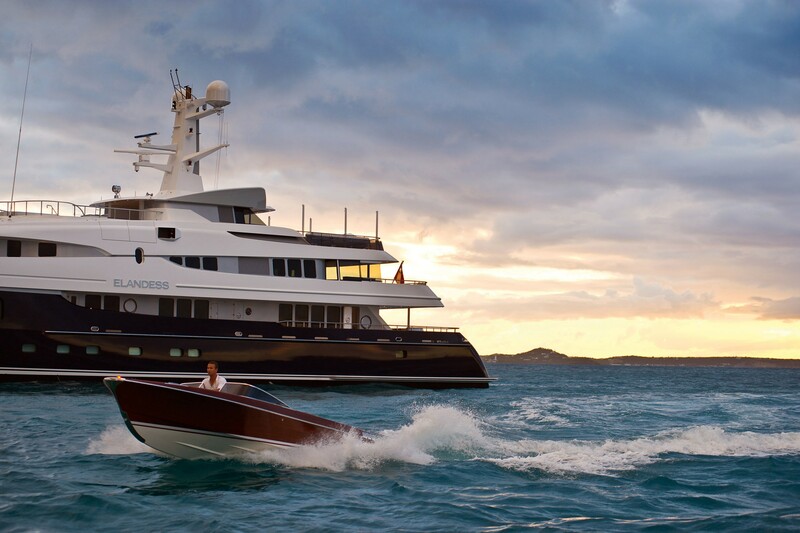 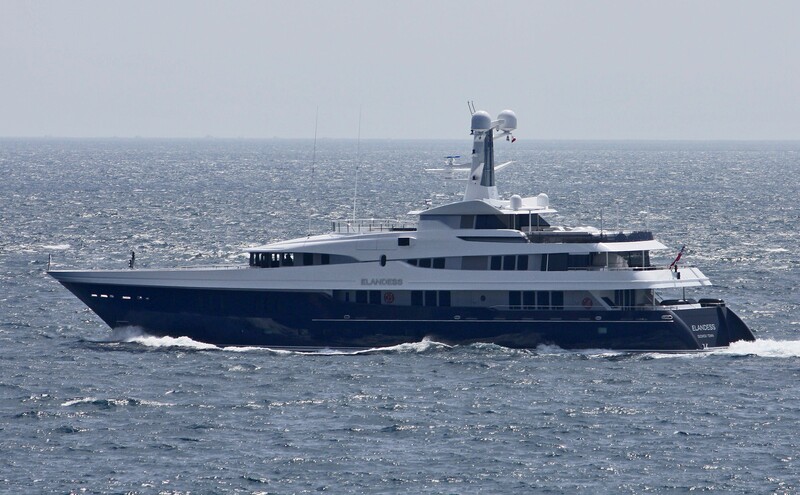 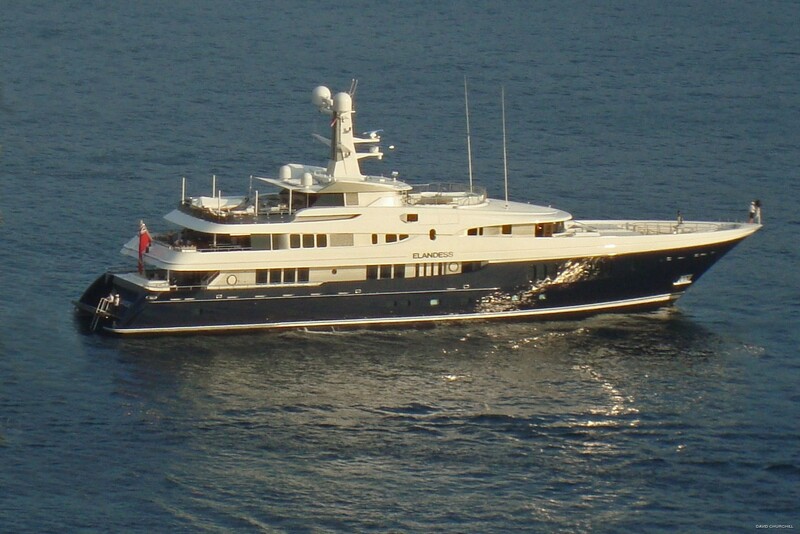 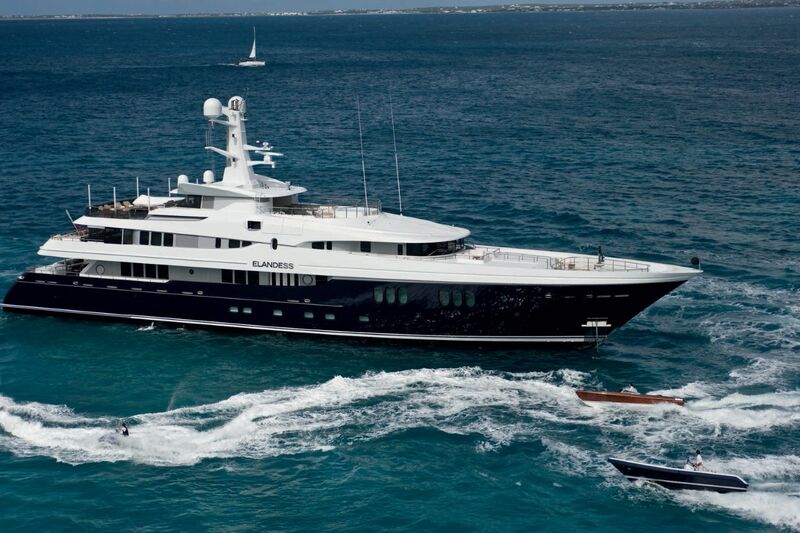 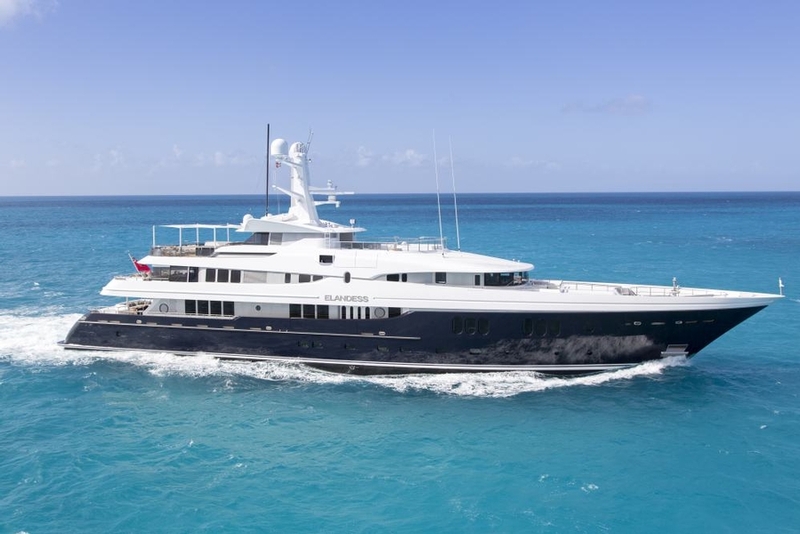 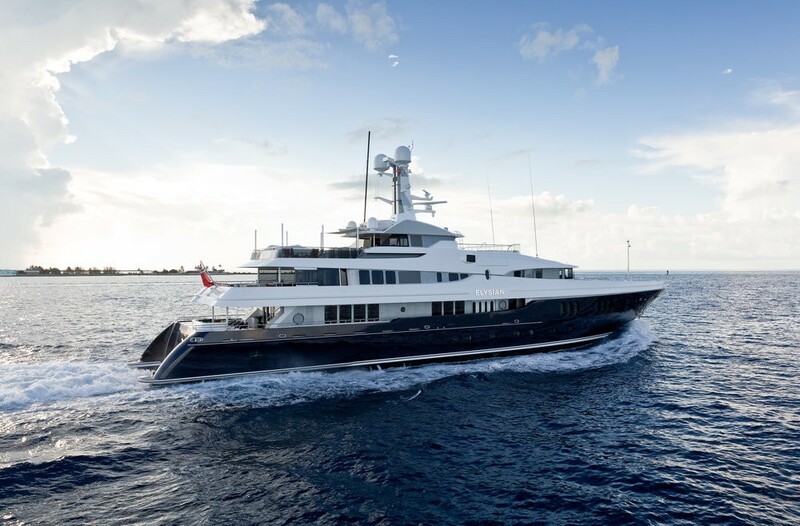 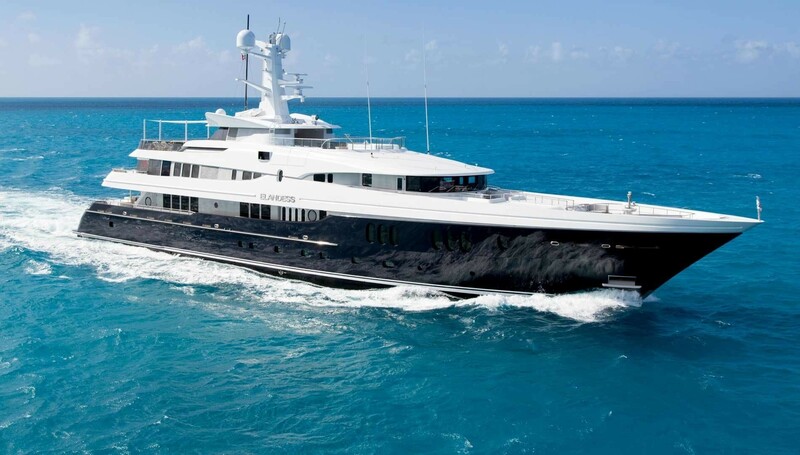 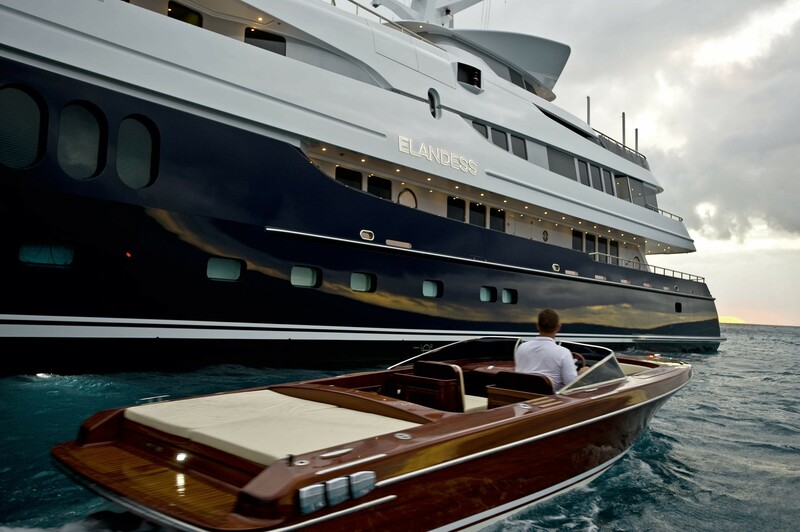 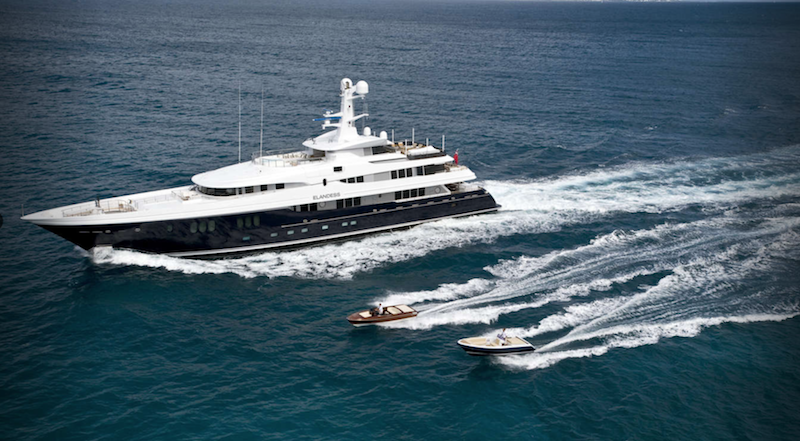 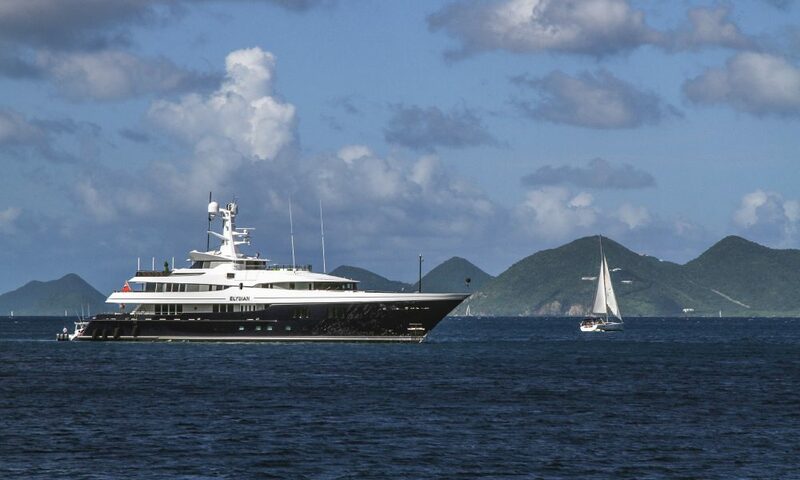 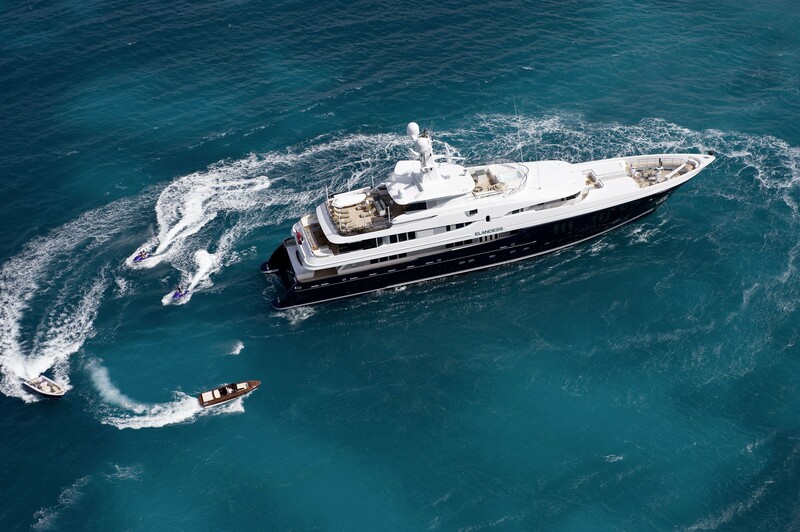 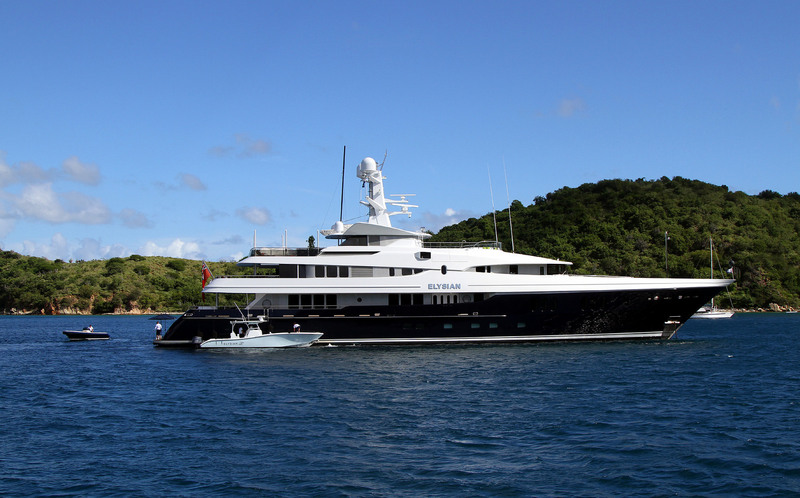 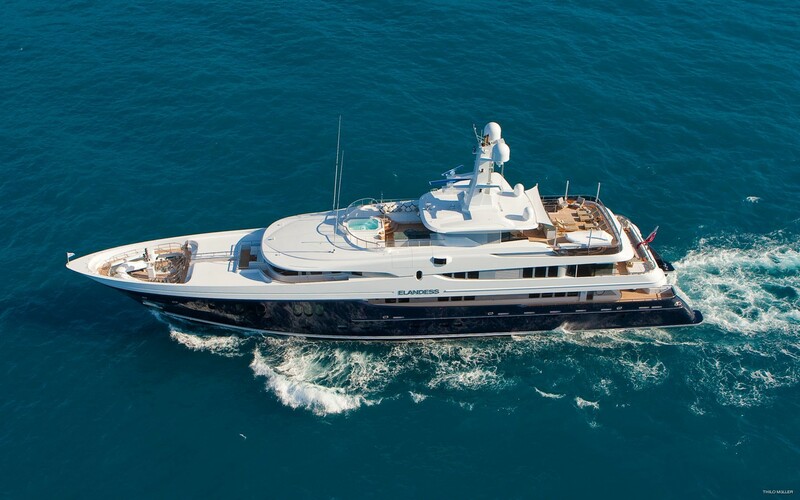 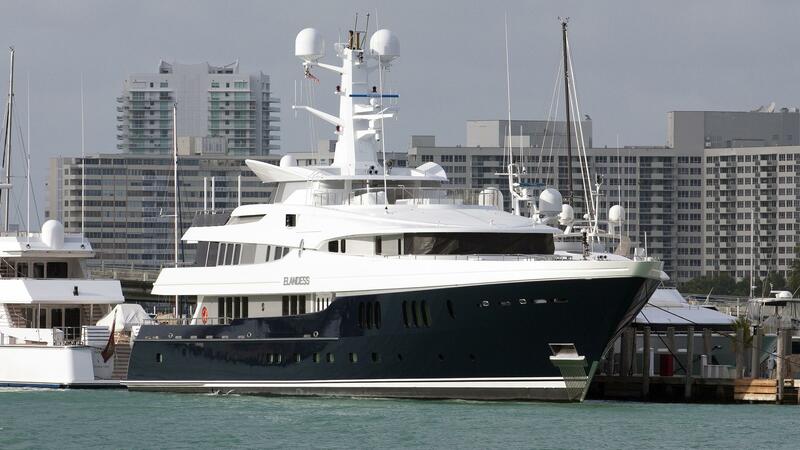 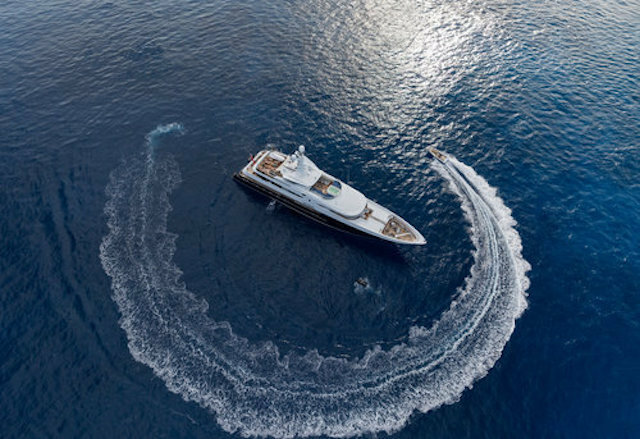 Superyacht Elysian off Norman Island.